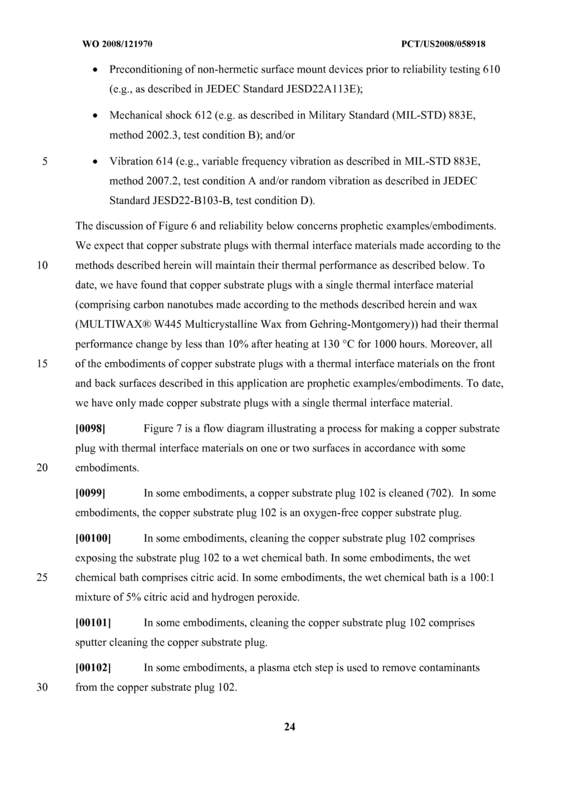 One embodiment involves an article of manufacture that includes: a copper substrate plug with a front surface and a back surface; a catalyst on top of a single surface of the copper substrate plug; and a thermal interface material on top of the single surface of the copper substrate plug. 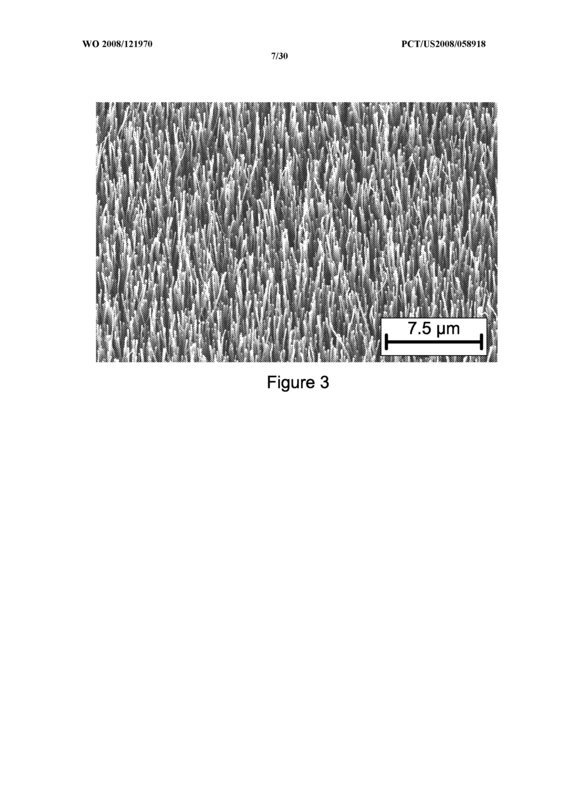 The thermal interface material comprises: a layer of carbon nanotubes that contacts the catalyst, and a filler material located between the carbon nanotubes. 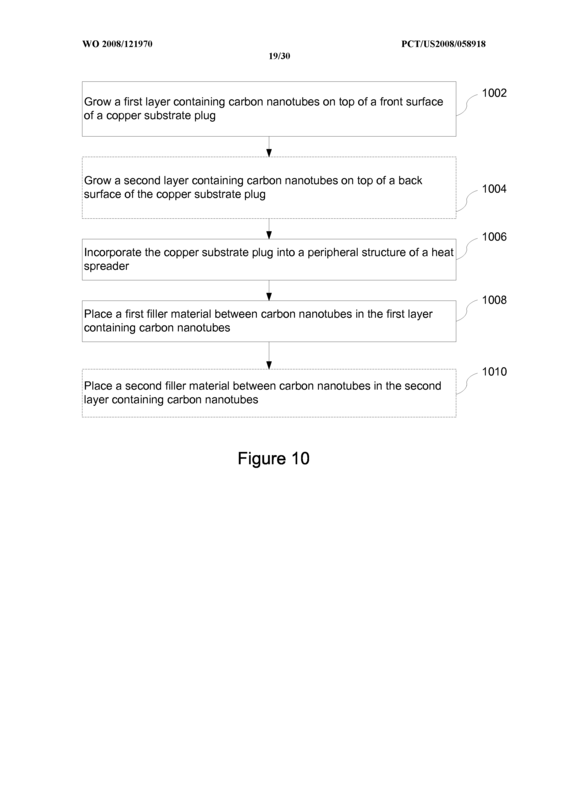 The carbon nanotubes are oriented substantially perpendicular to the single surface of the copper substrate plug. 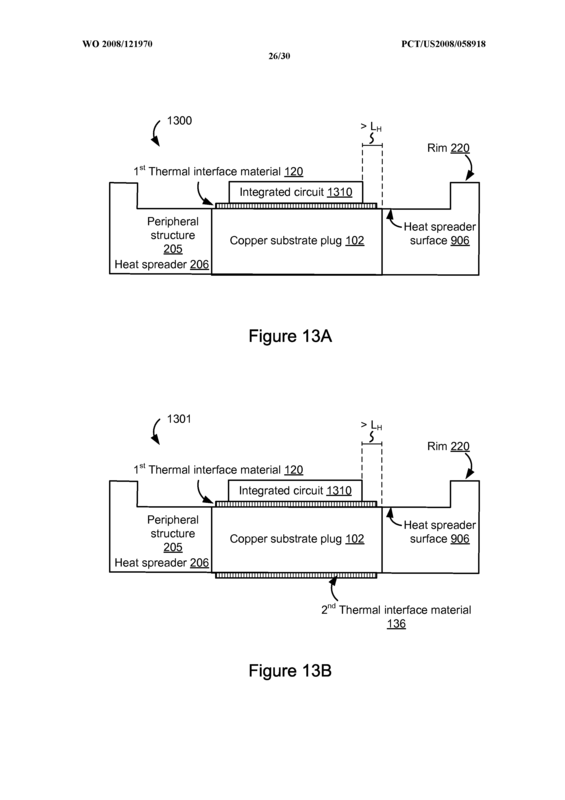 The copper substrate plug is configured to be incorporated in a peripheral structure of a heat spreader or a heat sink. 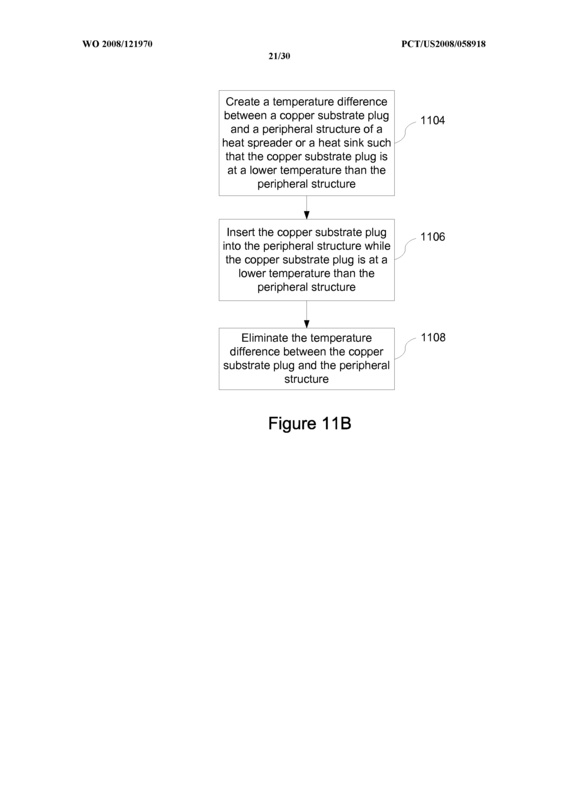 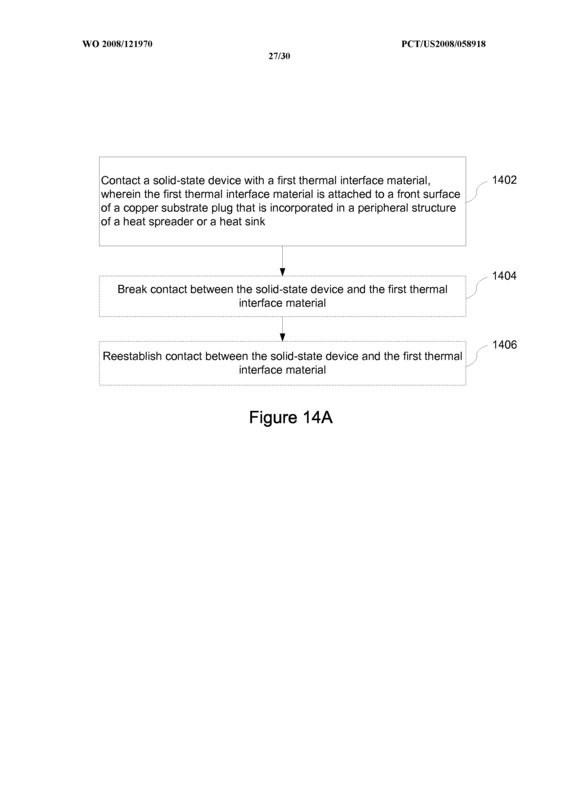 In another embodiment, the thermal interface material is on top of both the top and bottom surfaces of the copper substrate plug. 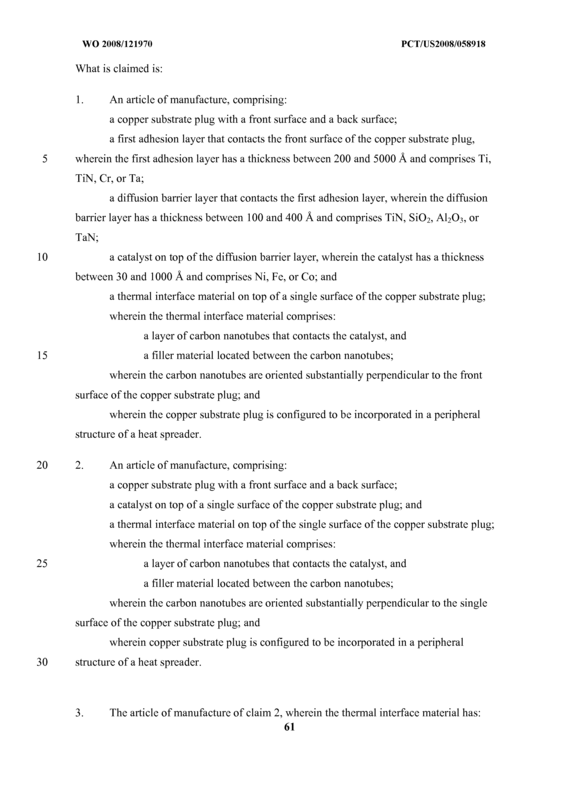 An article of manufacture, comprising: a copper substrate plug with a front surface and a back surface; a first adhesion layer that contacts the front surface of the copper substrate plug, wherein the first adhesion layer has a thickness between 200 and 5000 A and comprises Ti, TiN, Cr, or Ta; a diffusion barrier layer that contacts the first adhesion layer, wherein the diffusion barrier layer has a thickness between 100 and 400 A and comprises TiN, SiO2, AI2O3, or TaN; a catalyst on top of the diffusion barrier layer, wherein the catalyst has a thickness between 30 and 1000 A and comprises Ni, Fe, or Co; and a thermal interface material on top of a single surface of the copper substrate plug; wherein the thermal interface material comprises: a layer of carbon nanotubes that contacts the catalyst, and a filler material located between the carbon nanotubes; wherein the carbon nanotubes are oriented substantially perpendicular to the front surface of the copper substrate plug; and wherein the copper substrate plug is configured to be incorporated in a peripheral structure of a heat spreader. 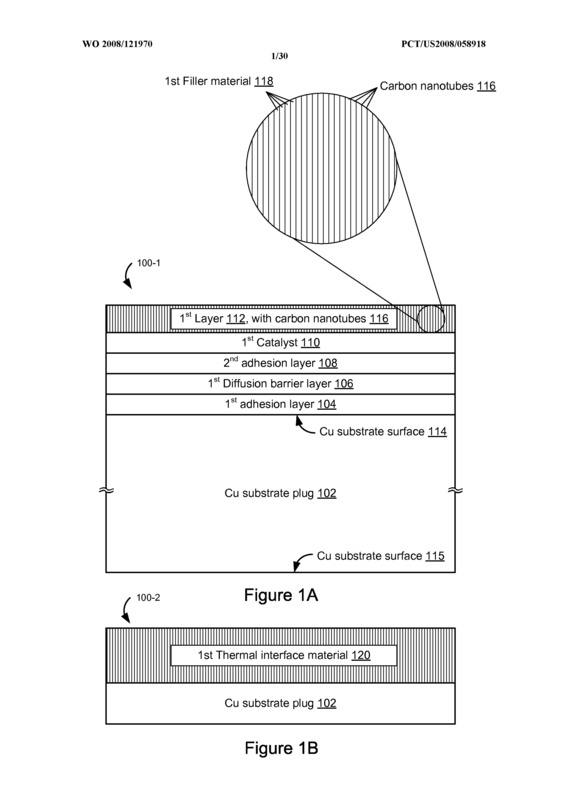 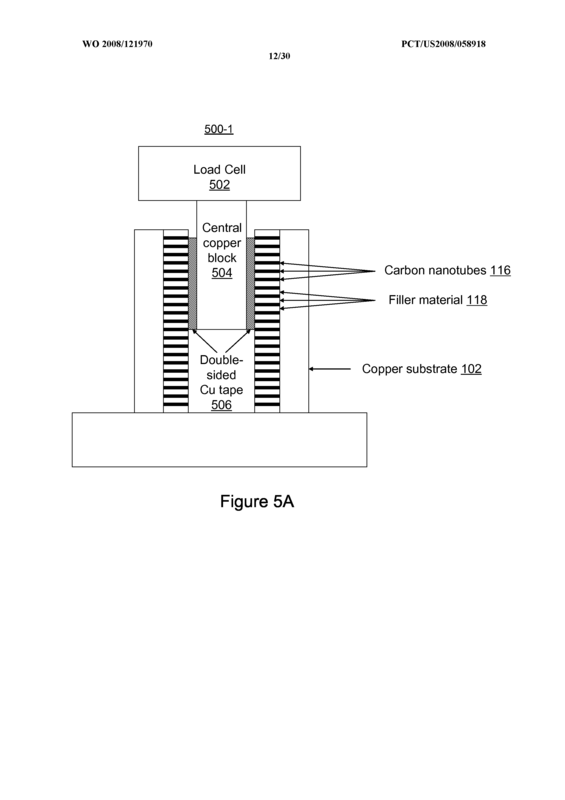 An article of manufacture, comprising: a copper substrate plug with a front surface and a back surface; a catalyst on top of a single surface of the copper substrate plug; and a thermal interface material on top of the single surface of the copper substrate plug; wherein the thermal interface material comprises: a layer of carbon nanotubes that contacts the catalyst, and a filler material located between the carbon nanotubes; wherein the carbon nanotubes are oriented substantially perpendicular to the single surface of the copper substrate plug; and wherein copper substrate plug is configured to be incorporated in a peripheral structure of a heat spreader. 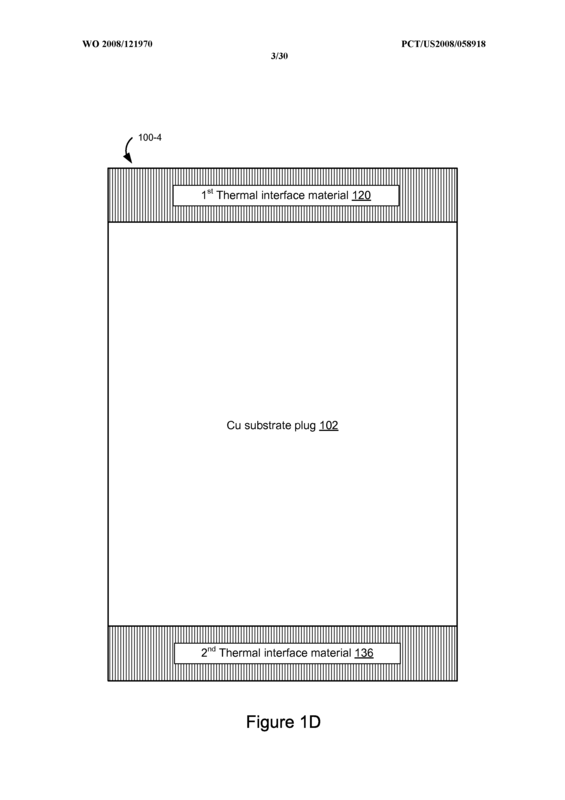 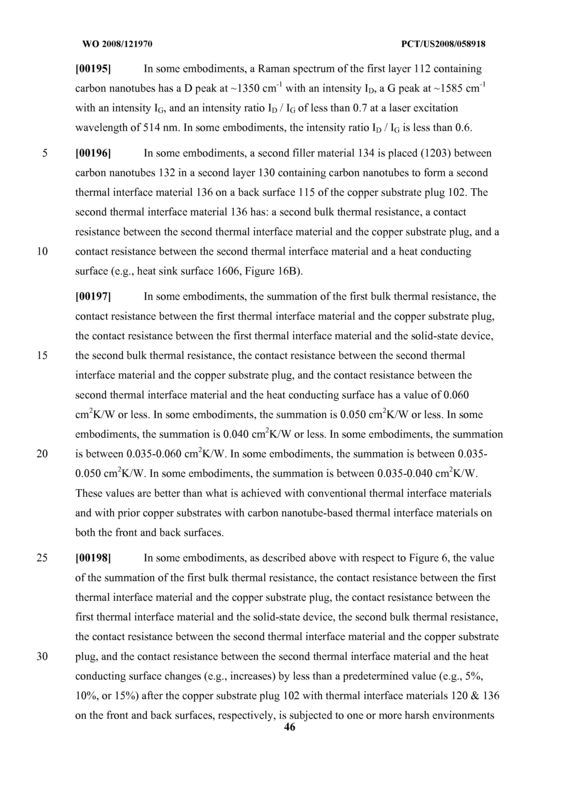 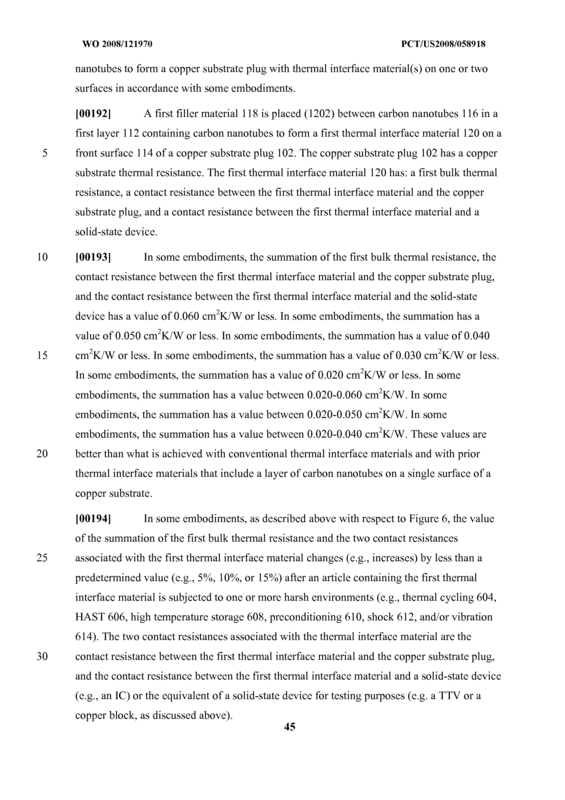 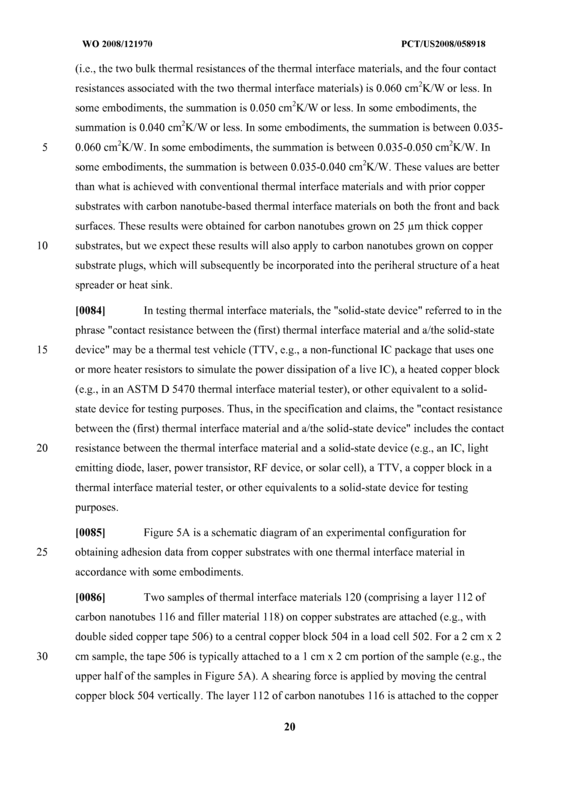 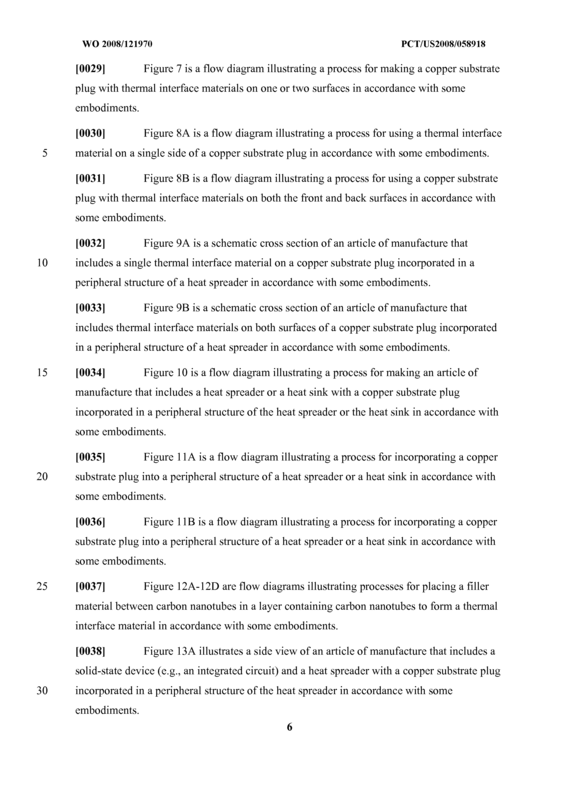 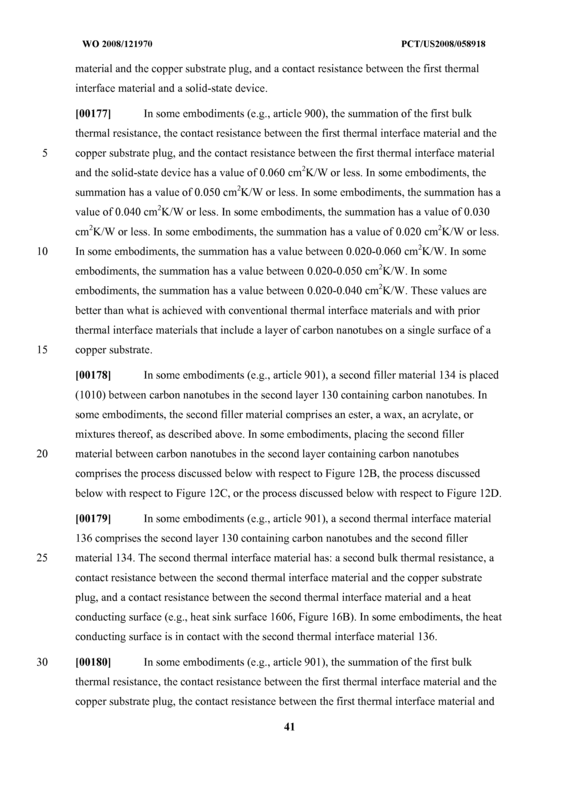 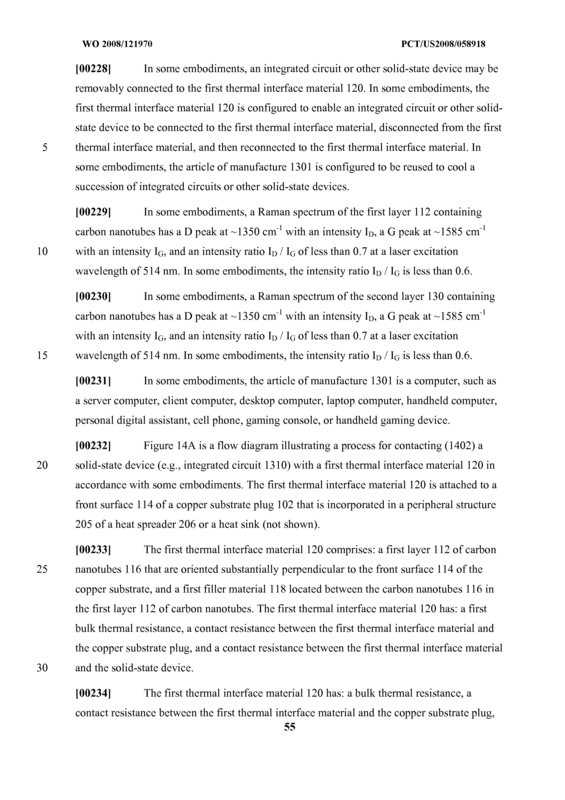 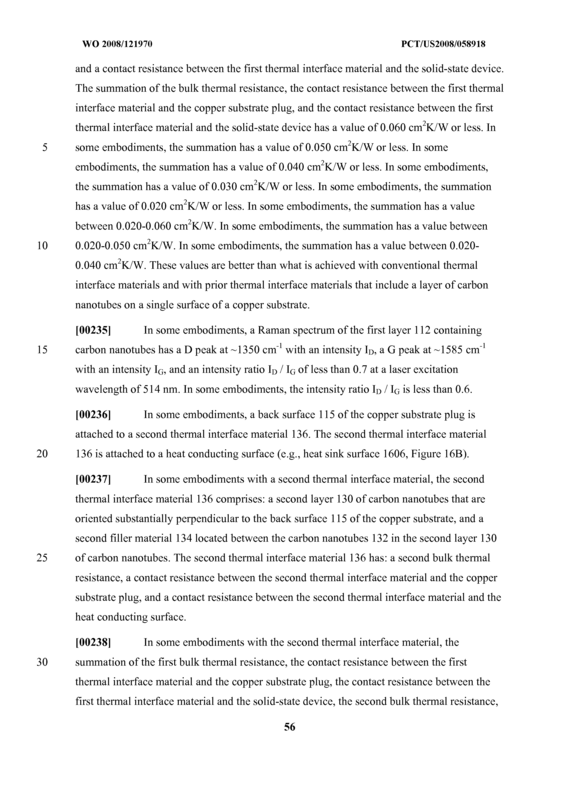 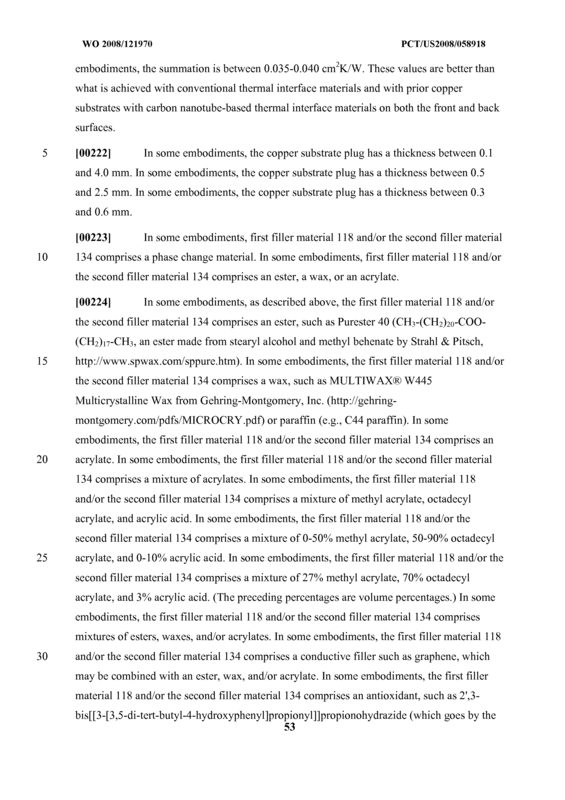 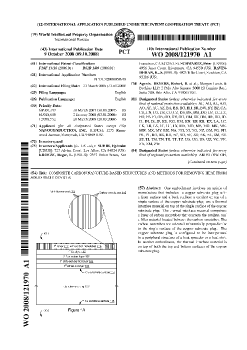 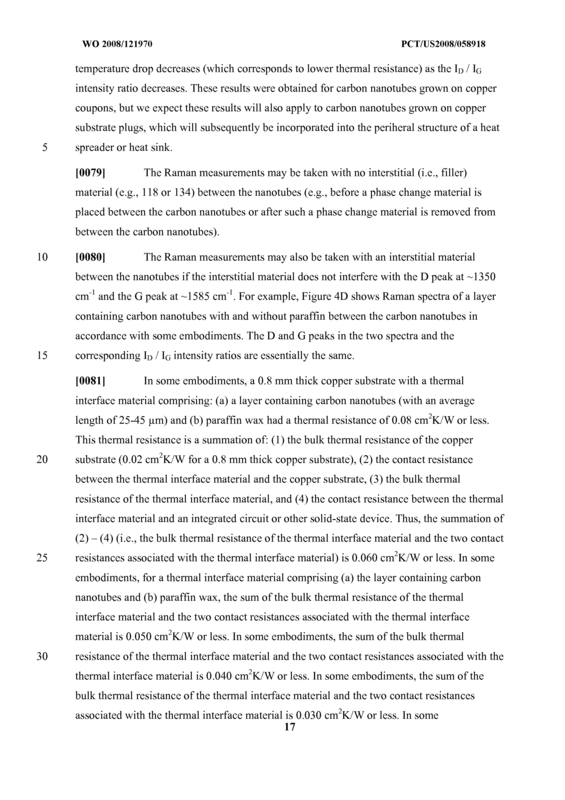 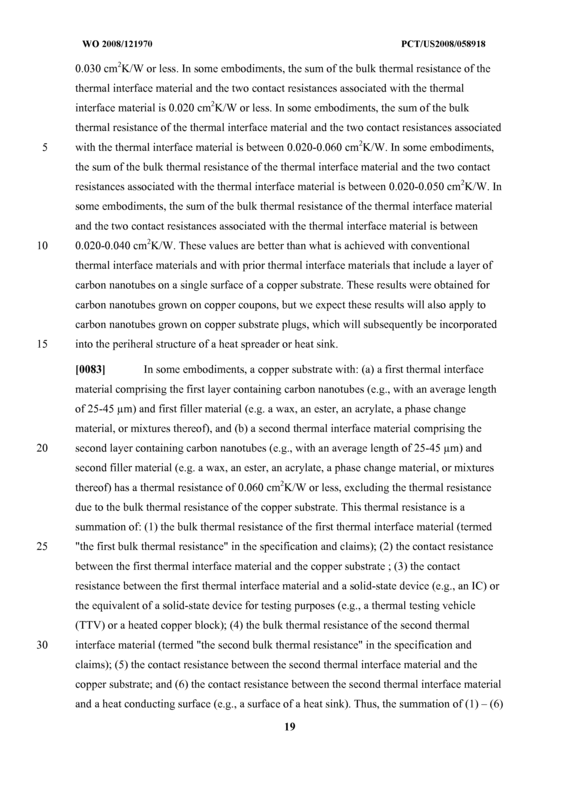 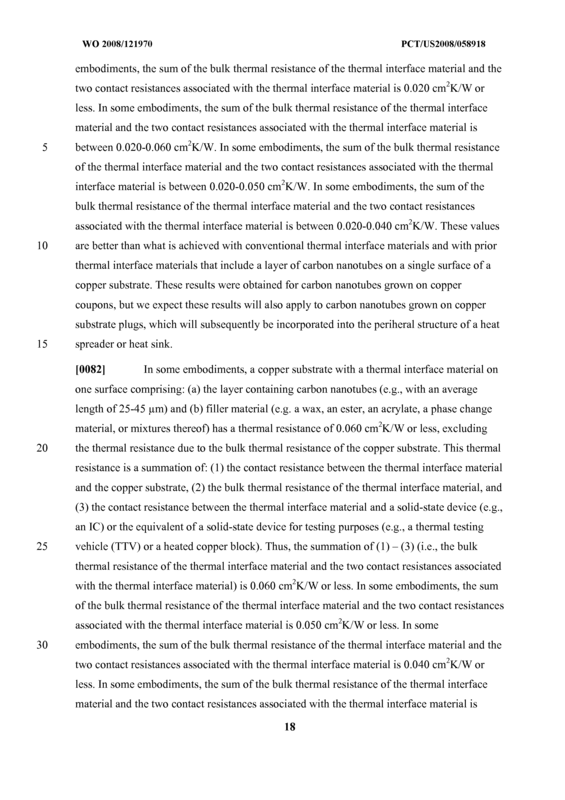 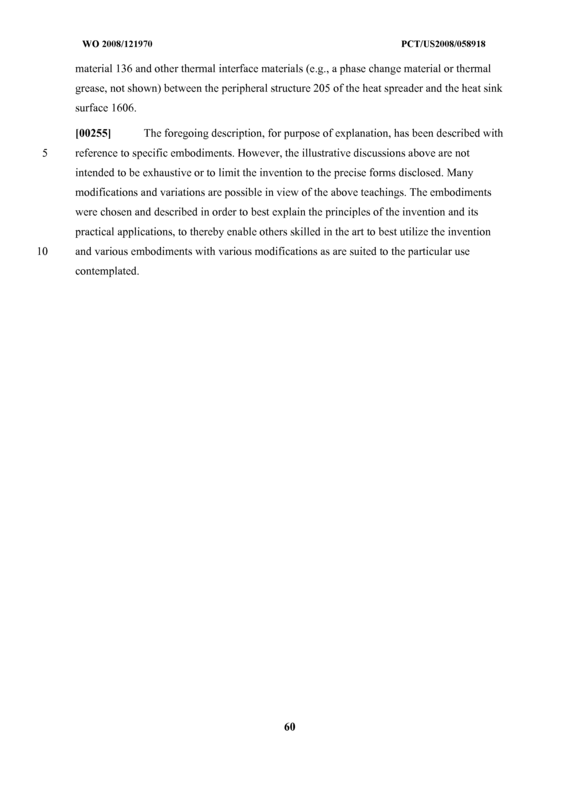 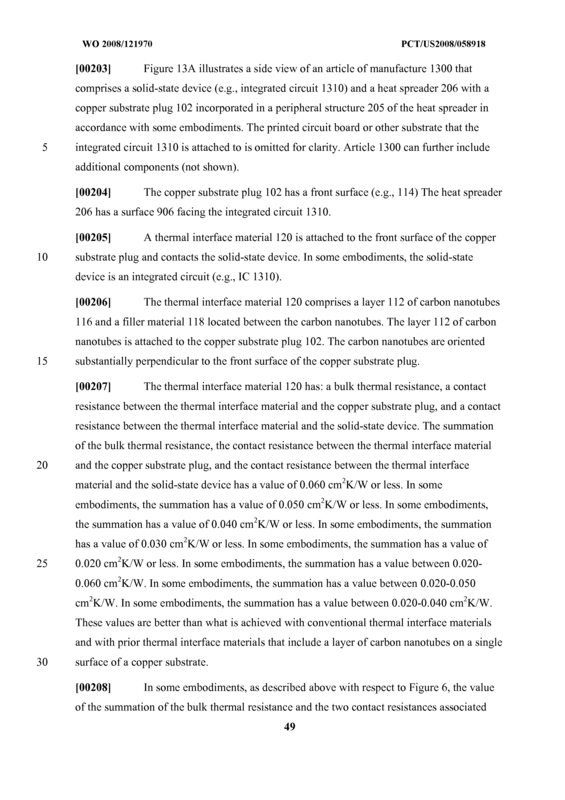 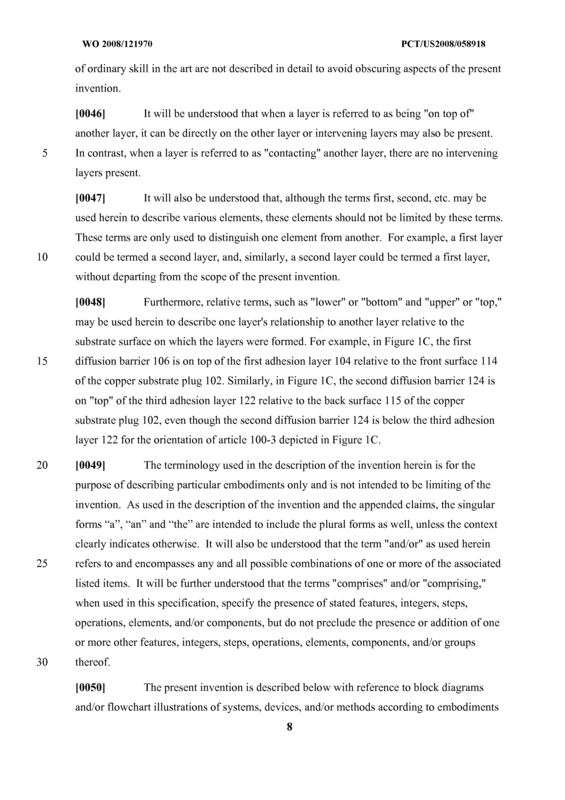 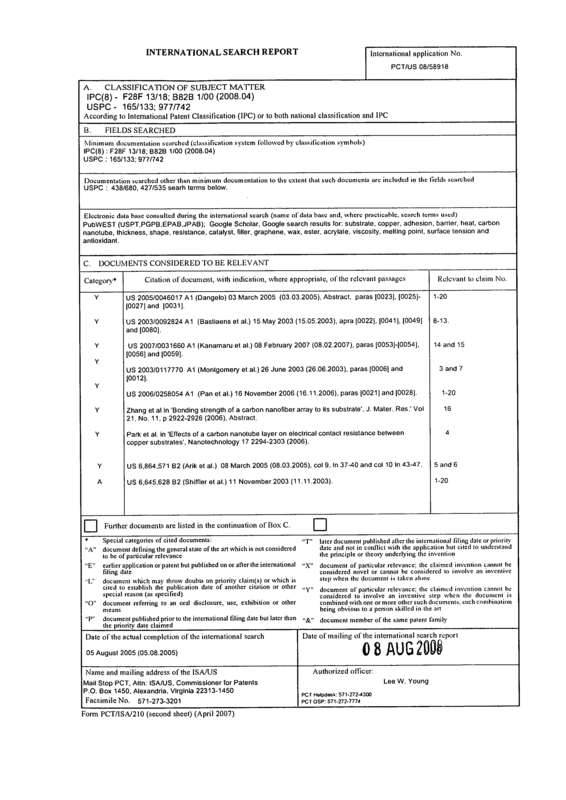 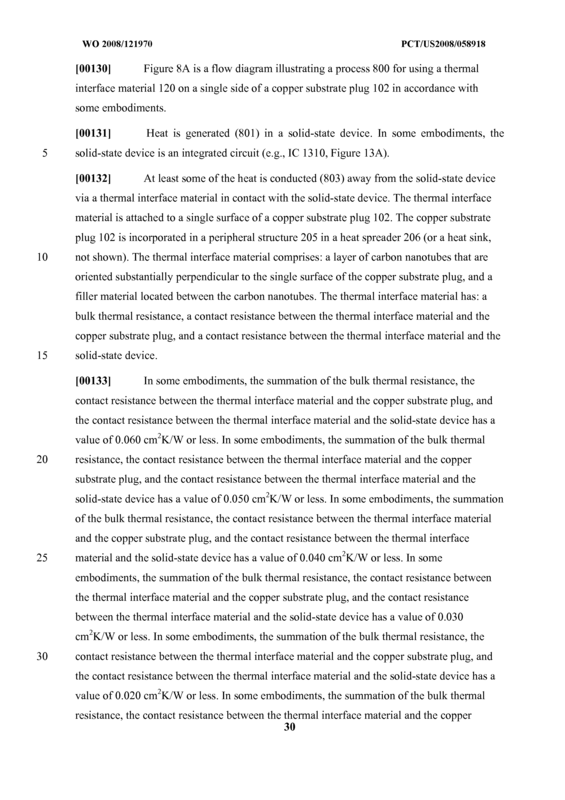 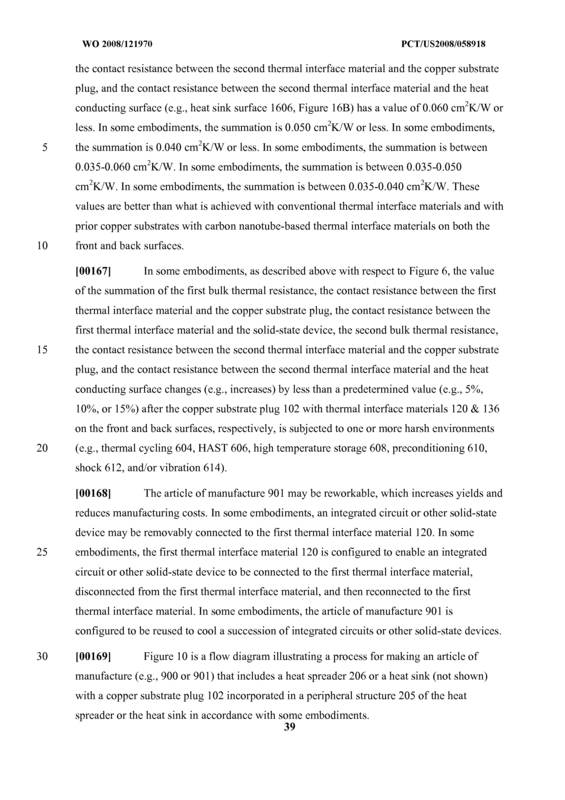 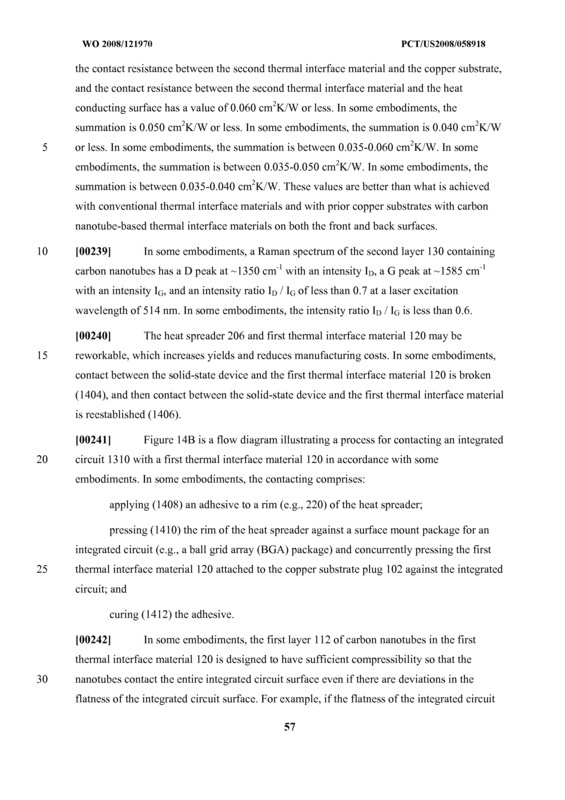 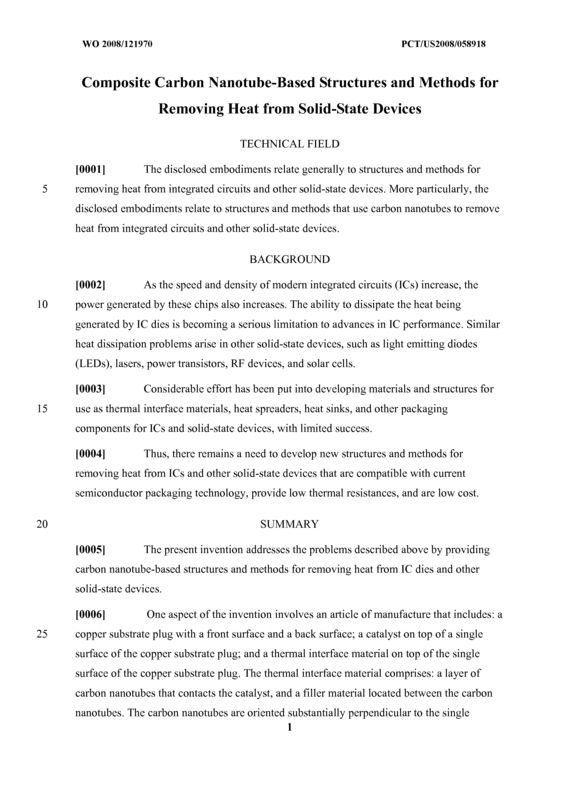 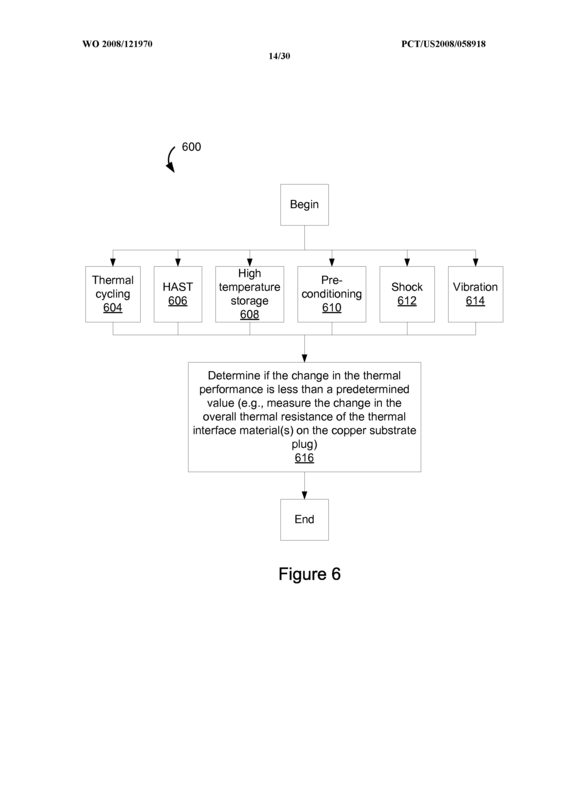 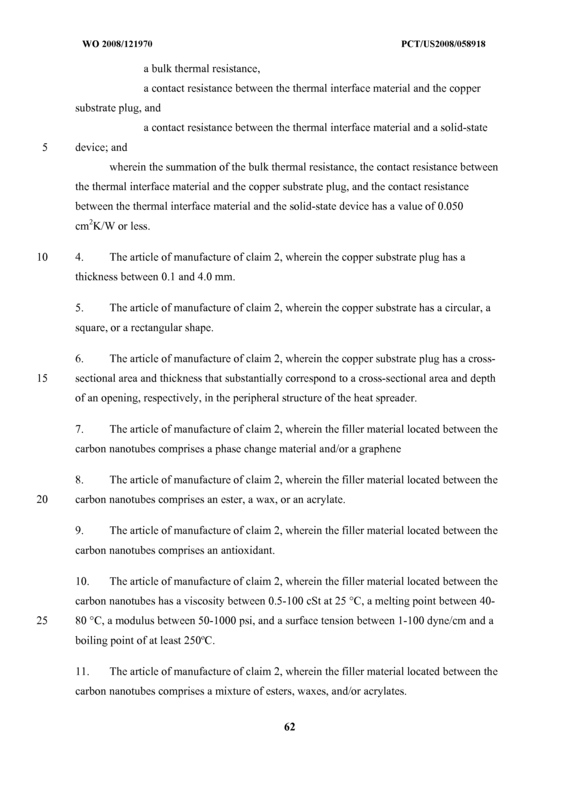 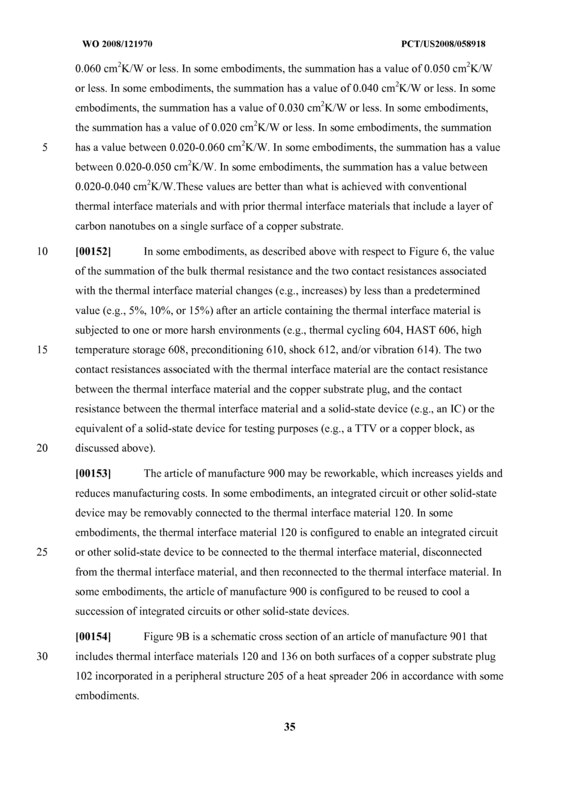 The article of manufacture of claim 2, wherein the thermal interface material has: a bulk thermal resistance, a contact resistance between the thermal interface material and the copper substrate plug, and a contact resistance between the thermal interface material and a solid-state device; and wherein the summation of the bulk thermal resistance, the contact resistance between the thermal interface material and the copper substrate plug, and the contact resistance between the thermal interface material and the solid-state device has a value of 0.050 cm2K/W or less. 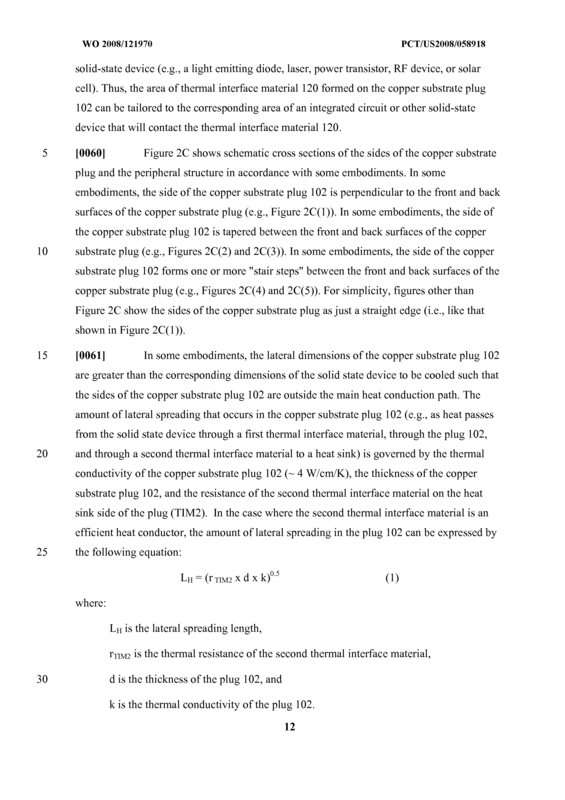 The article of manufacture of claim 2, wherein the copper substrate plug has a thickness between 0.1 and 4.0 mm. 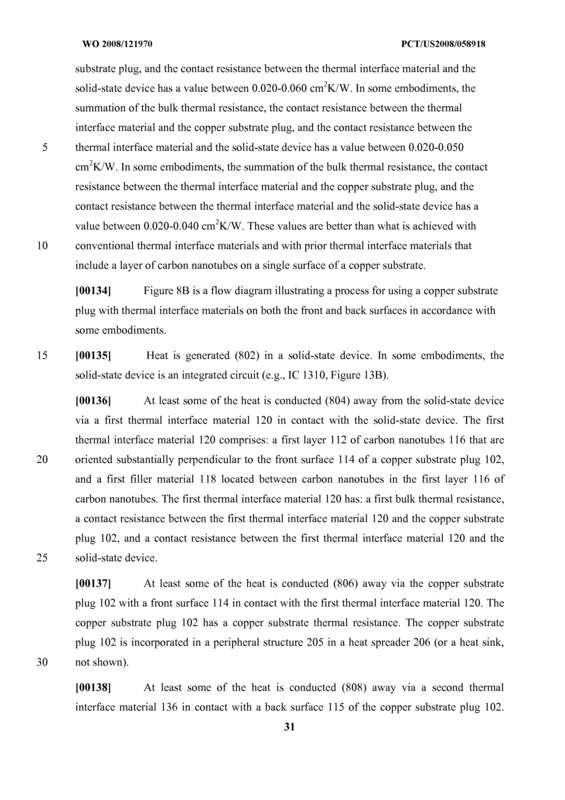 The article of manufacture of claim 2, wherein the copper substrate has a circular, a square, or a rectangular shape. 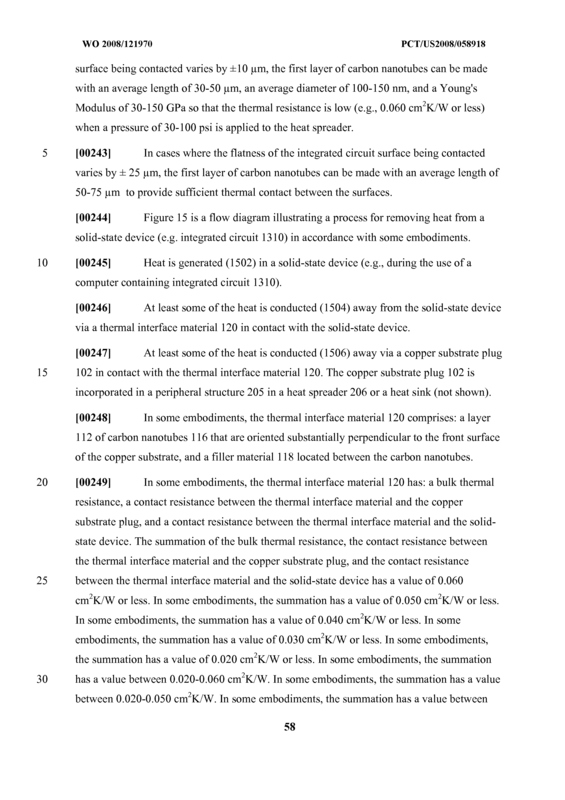 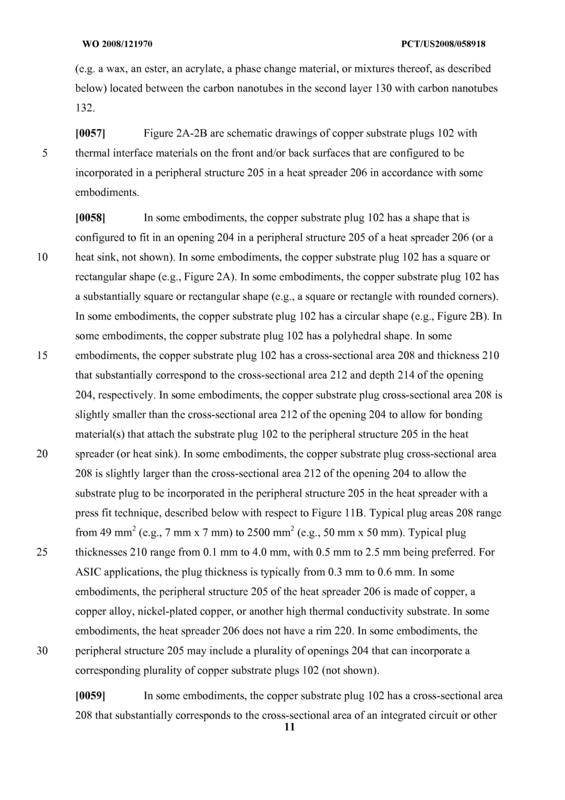 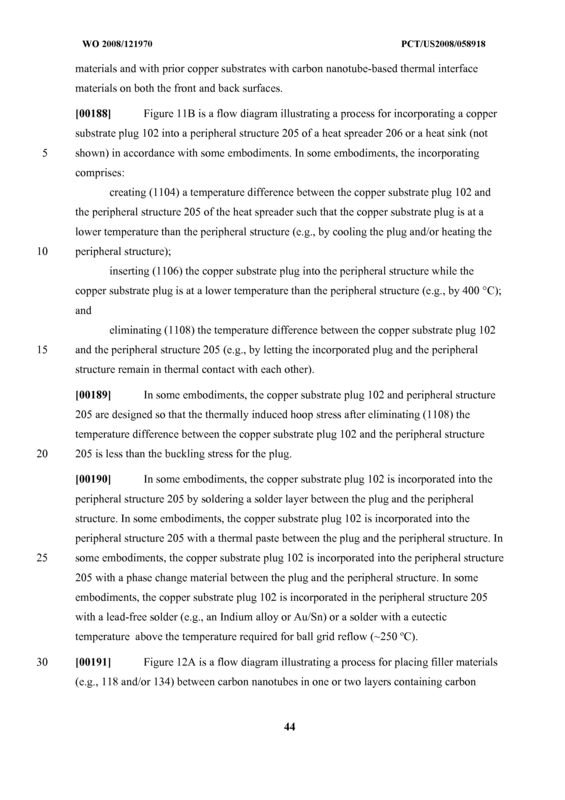 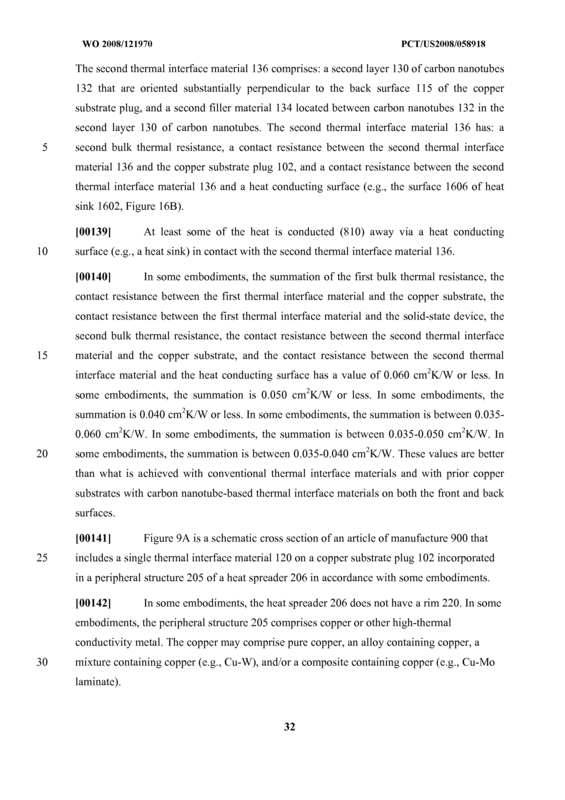 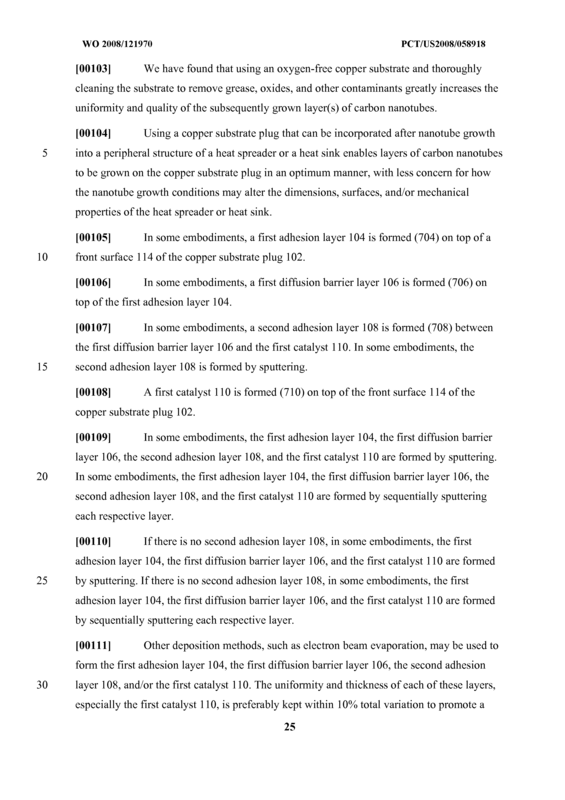 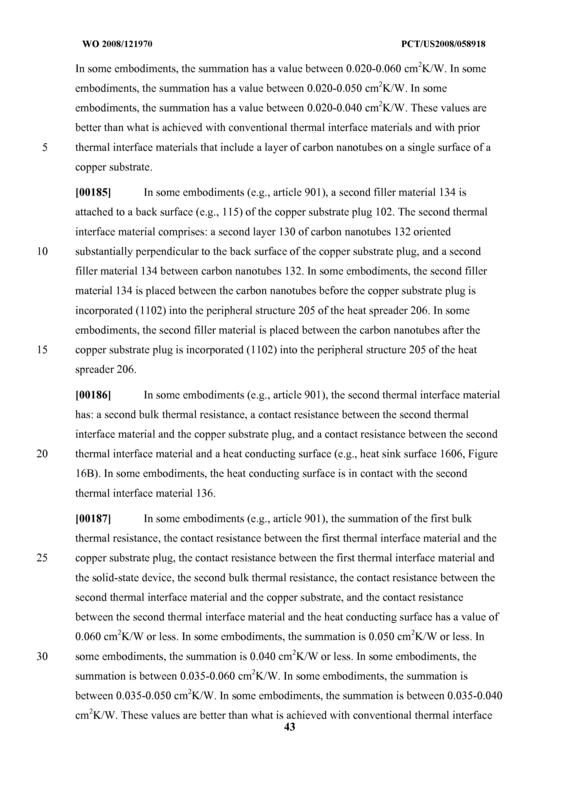 The article of manufacture of claim 2, wherein the copper substrate plug has a cross- sectional area and thickness that substantially correspond to a cross-sectional area and depth of an opening, respectively, in the peripheral structure of the heat spreader. 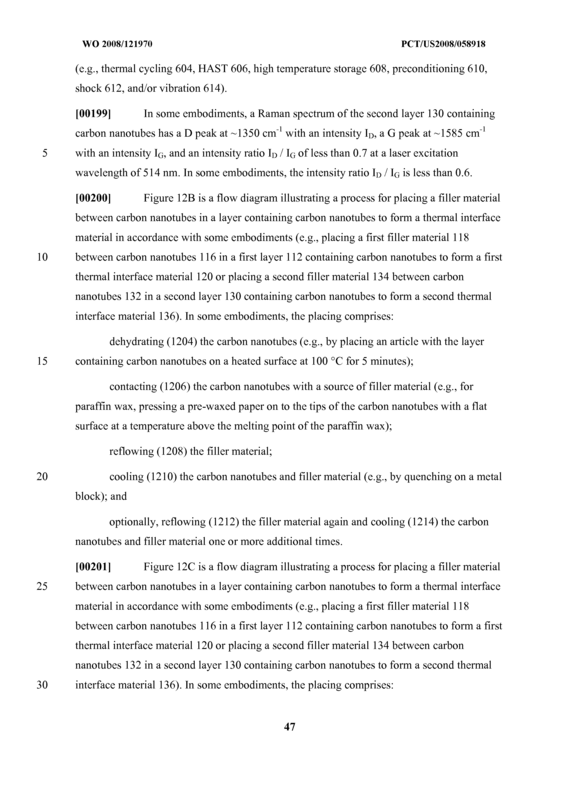 The article of manufacture of claim 2, wherein the filler material located between the carbon nanotubes comprises an ester, a wax, or an acrylate. 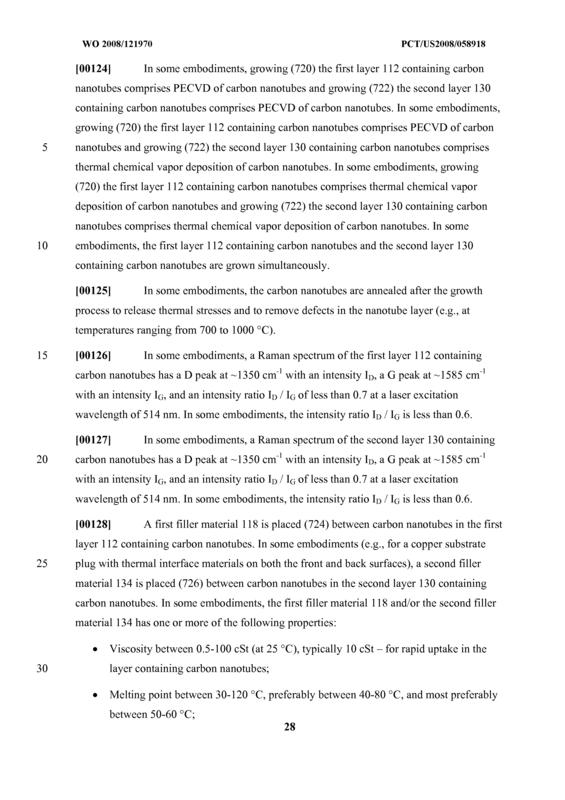 The article of manufacture of claim 2, wherein the filler material located between the carbon nanotubes comprises an antioxidant. 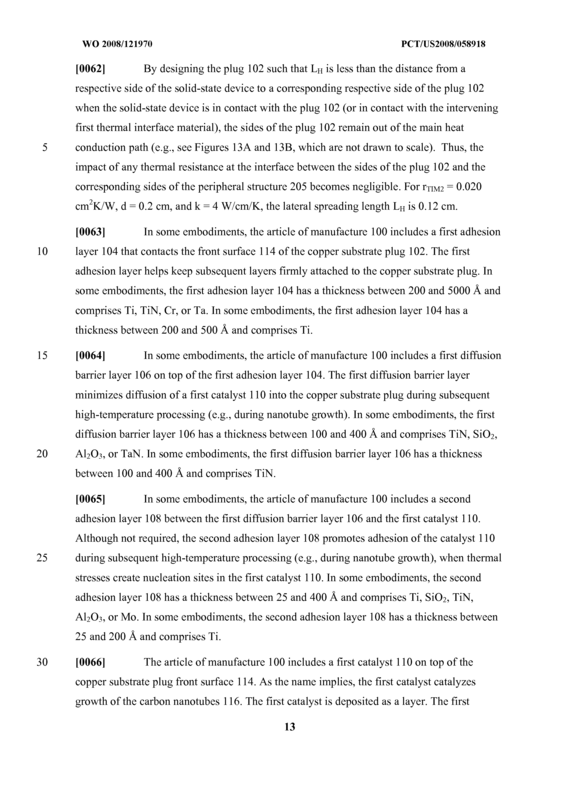 The article of manufacture of claim 2, wherein the filler material located between the carbon nanotubes has a viscosity between 0.5-100 cSt at 25 0C, a melting point between 40- 80 0C, a modulus between 50-1000 psi, and a surface tension between 1-100 dyne/cm and a boiling point of at least 25O0C. 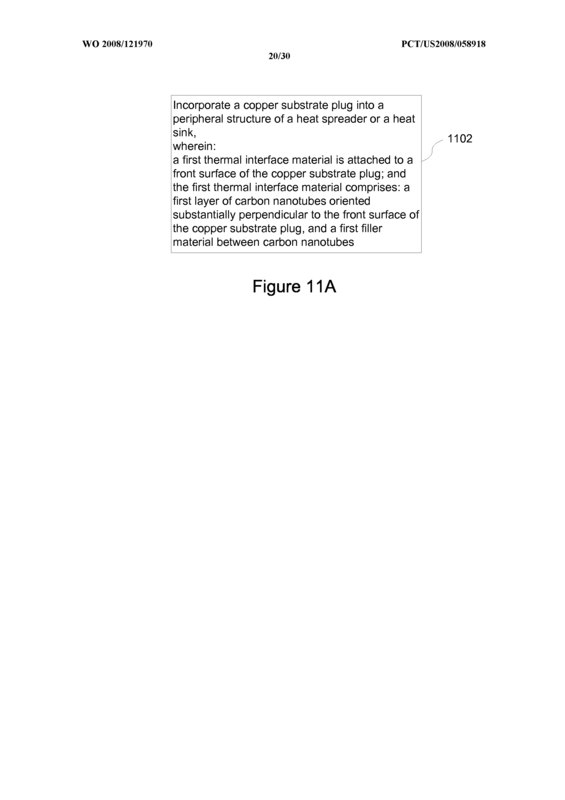 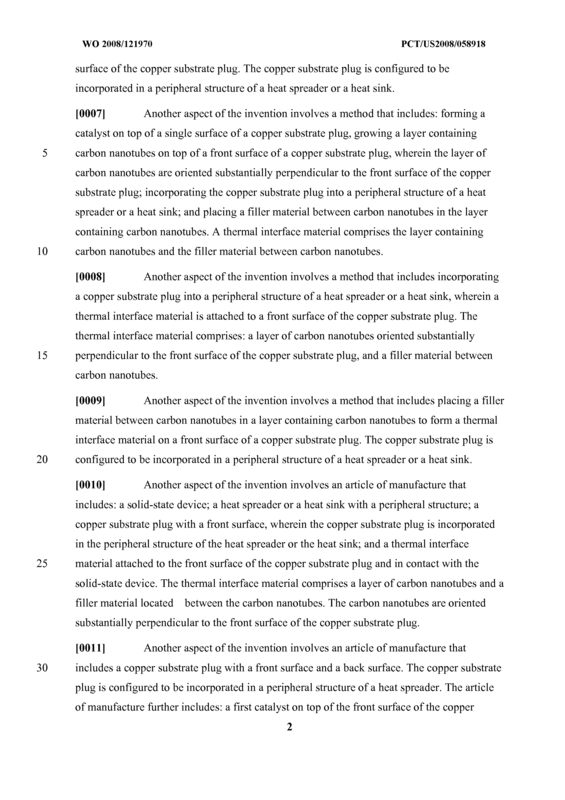 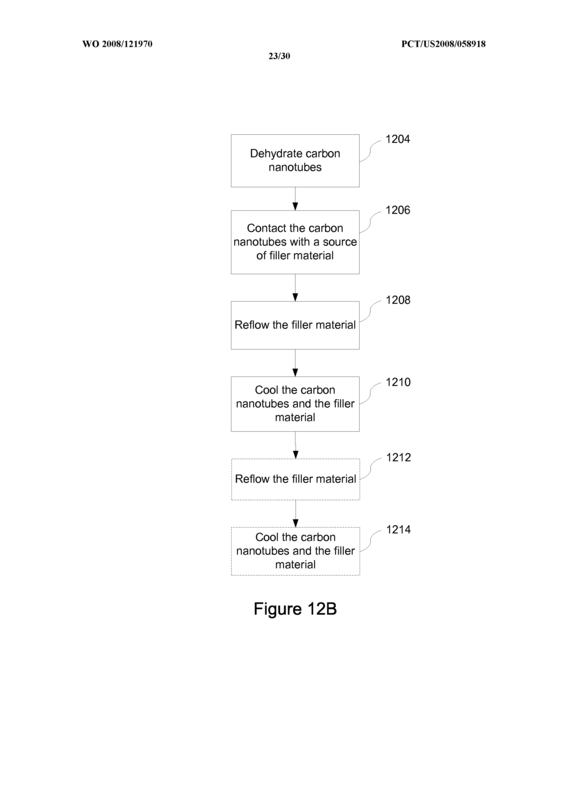 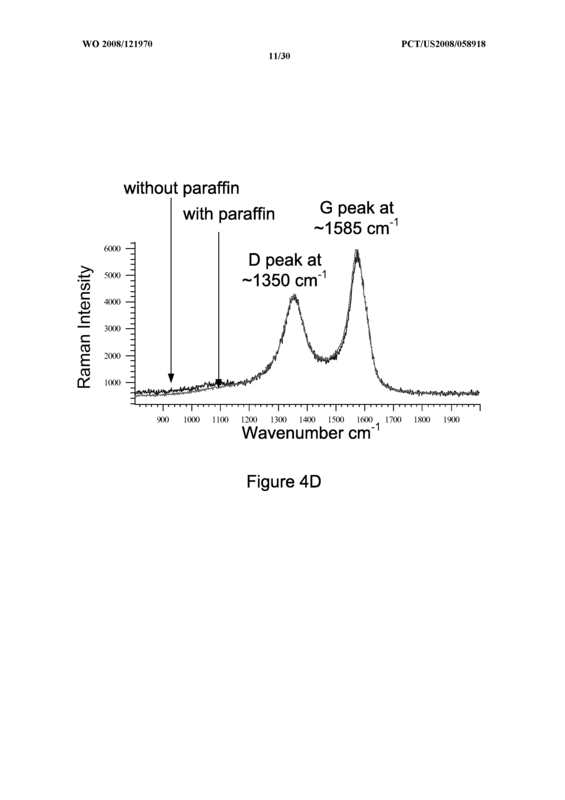 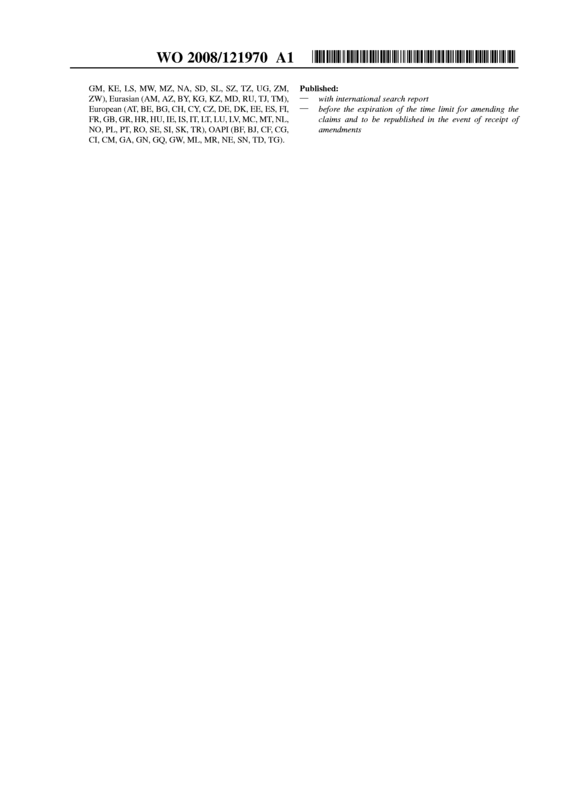 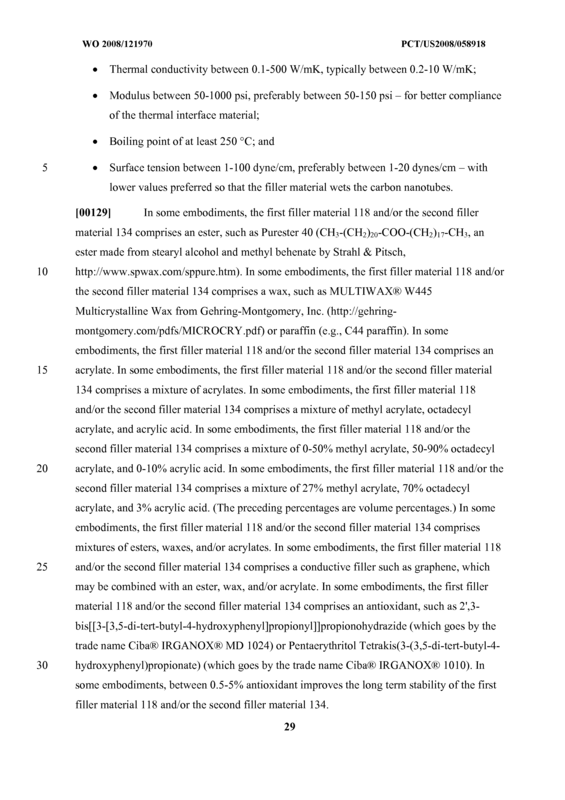 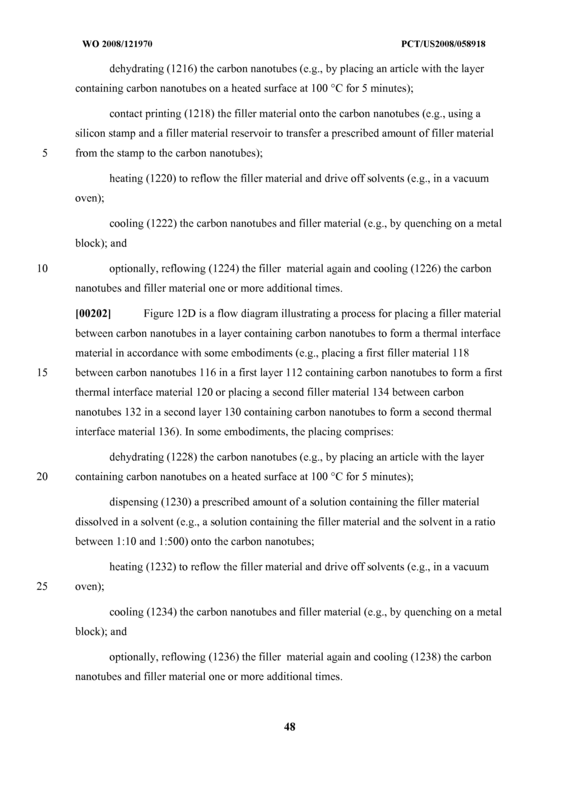 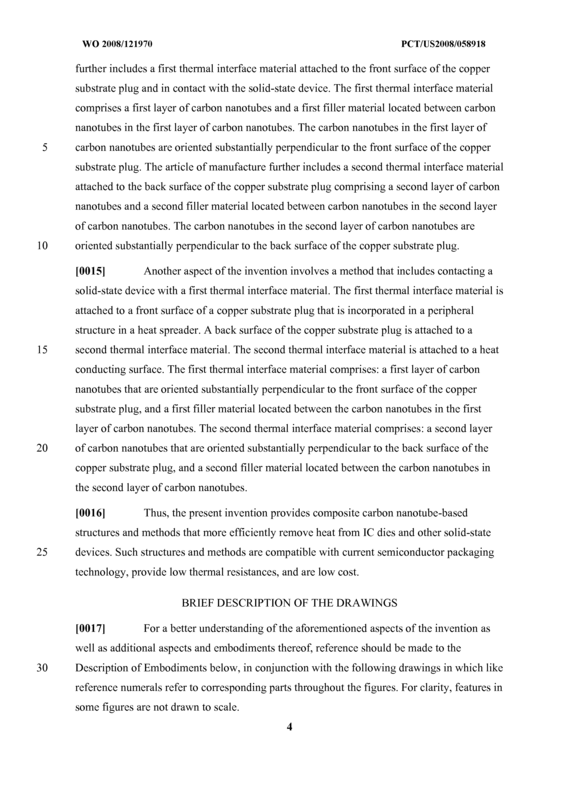 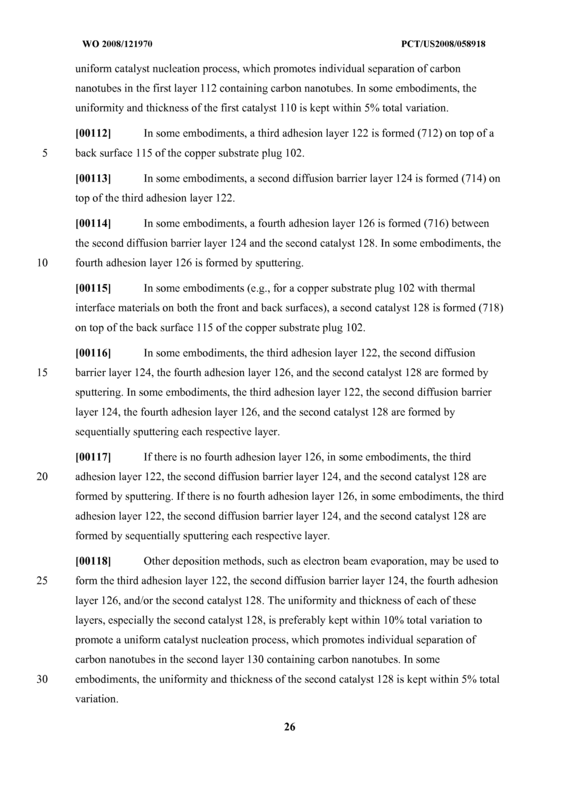 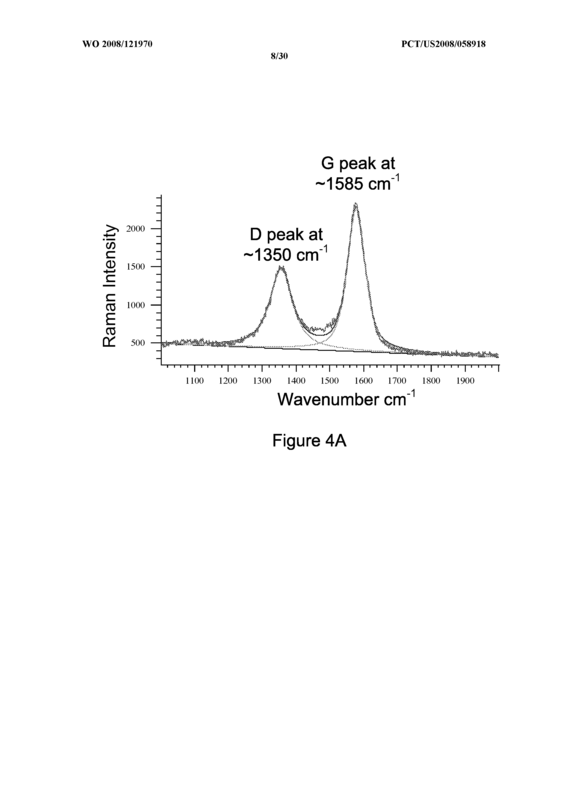 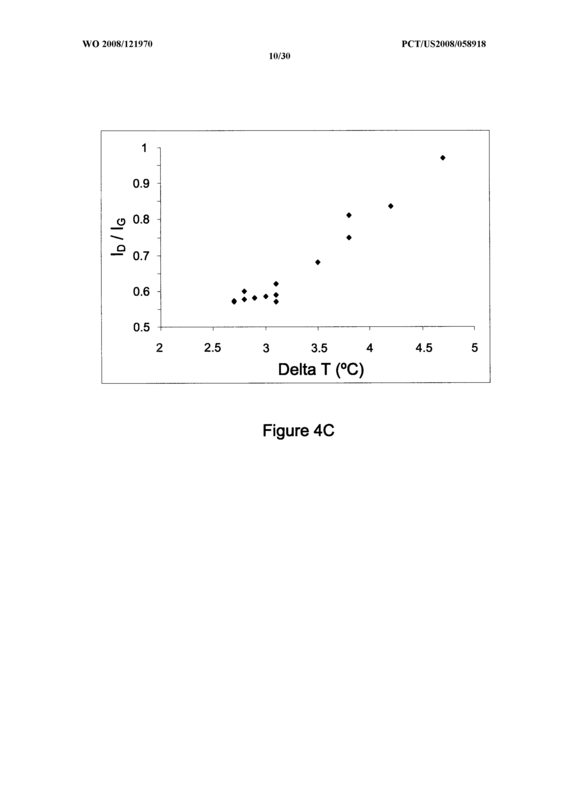 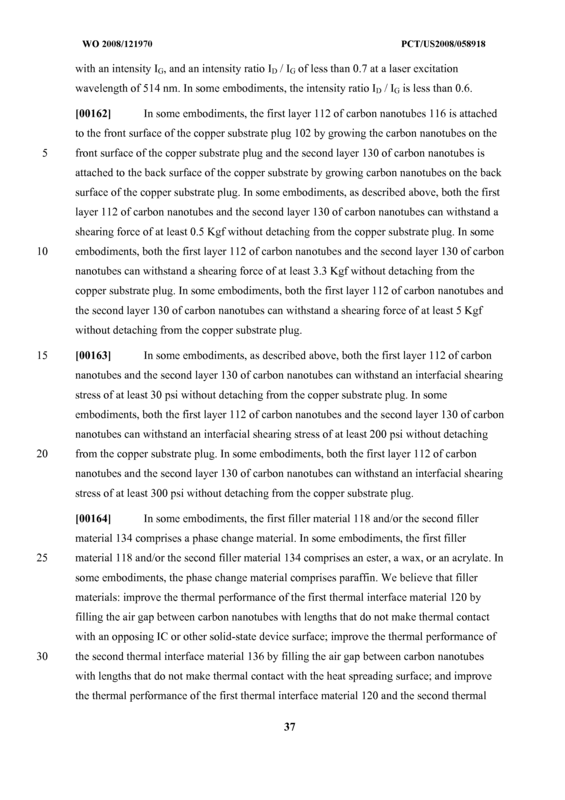 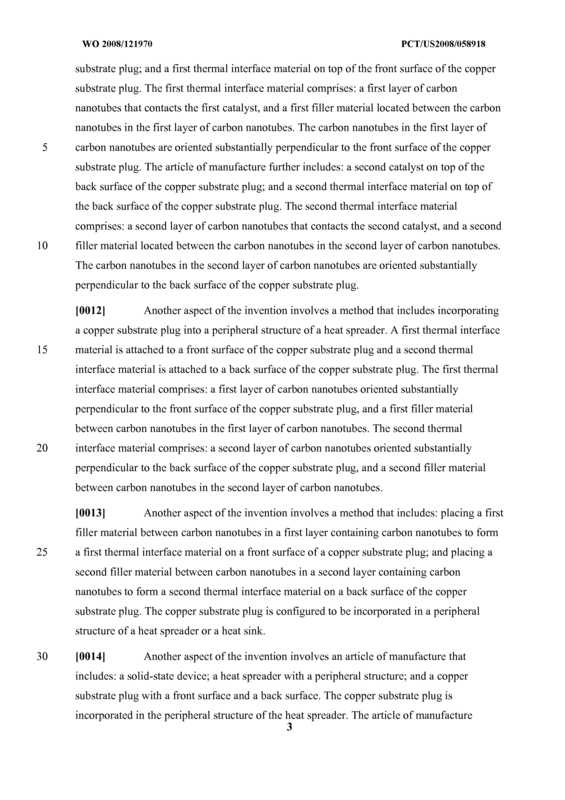 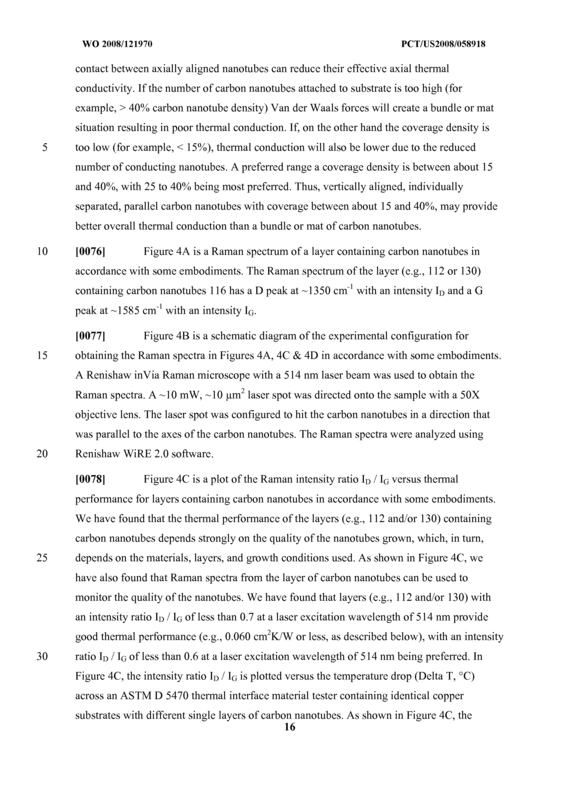 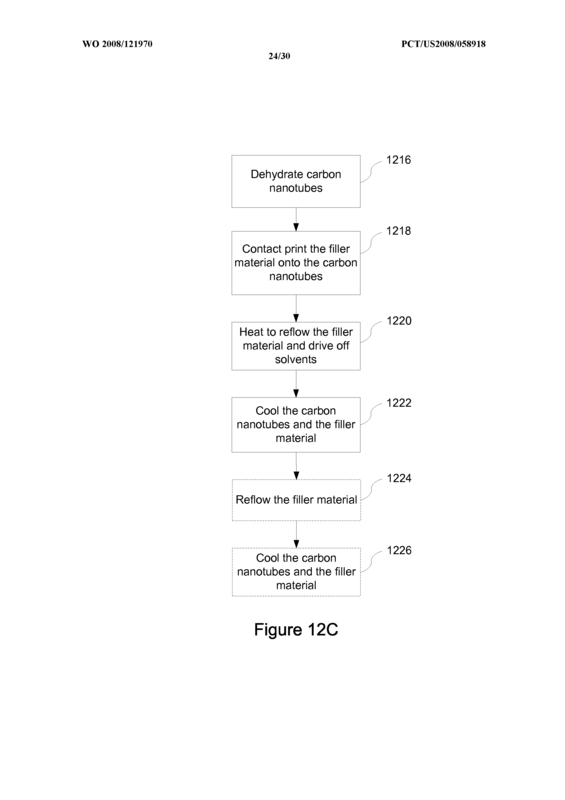 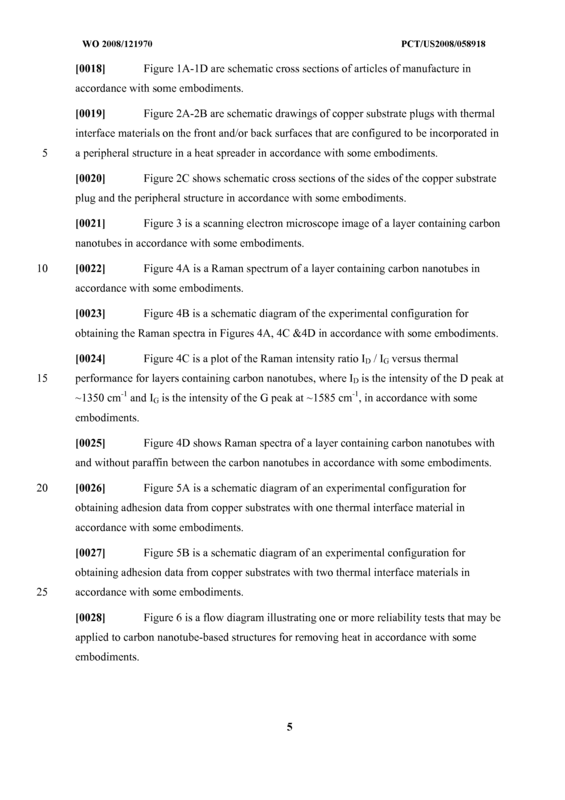 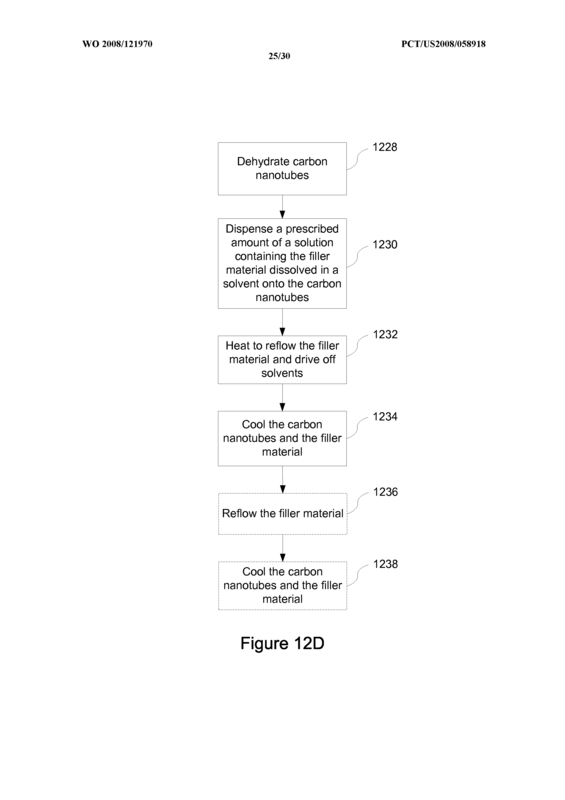 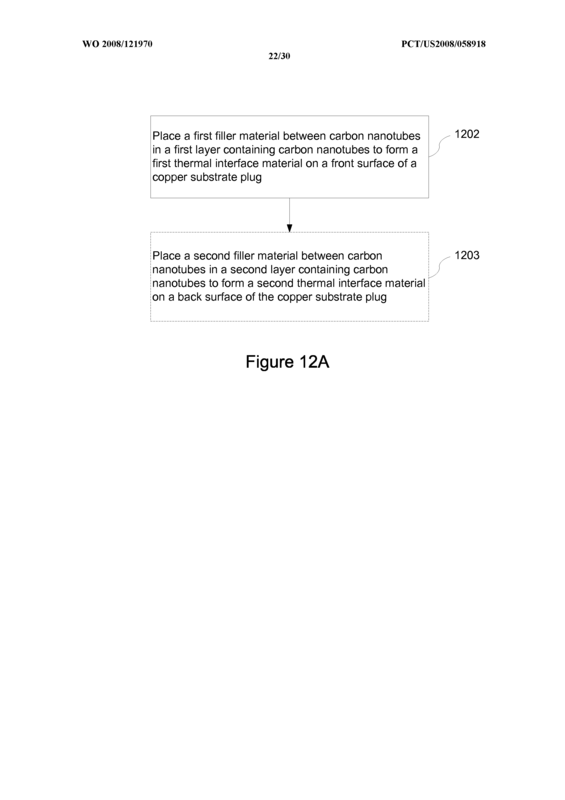 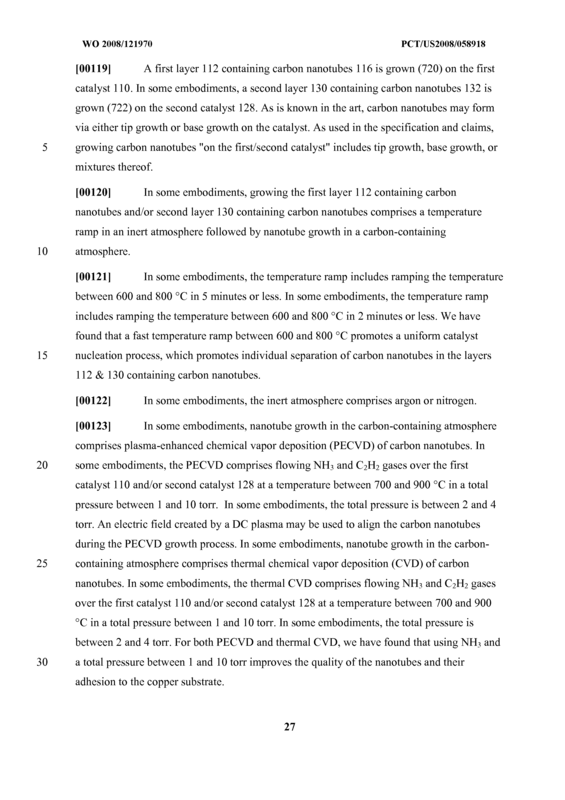 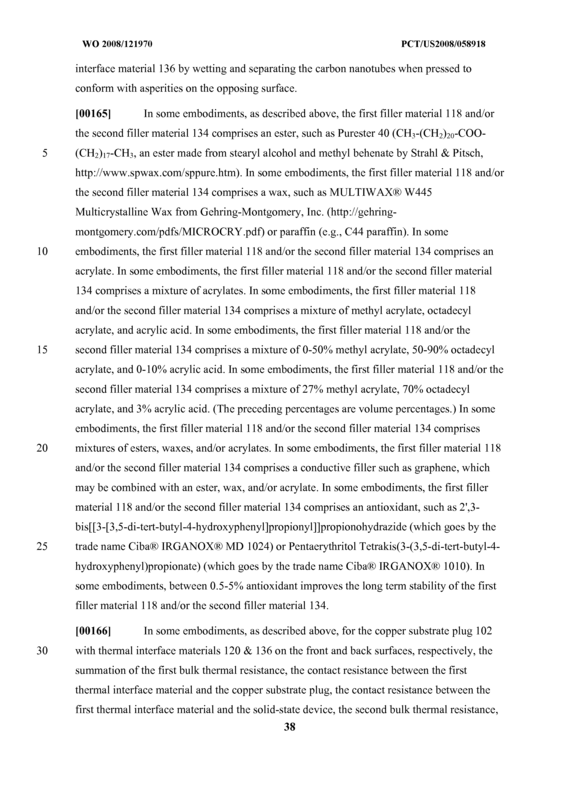 The article of manufacture of claim 2, wherein the filler material located between the carbon nanotubes comprises a mixture of esters, waxes, and/or acrylates. 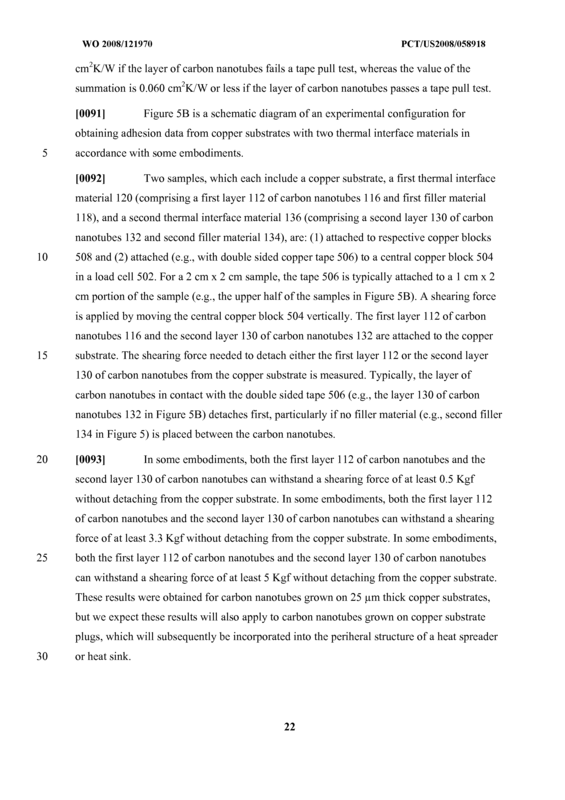 The article of manufacture of claim 2, wherein the filler material located between the carbon nanotubes comprises a mixture of acrylates. 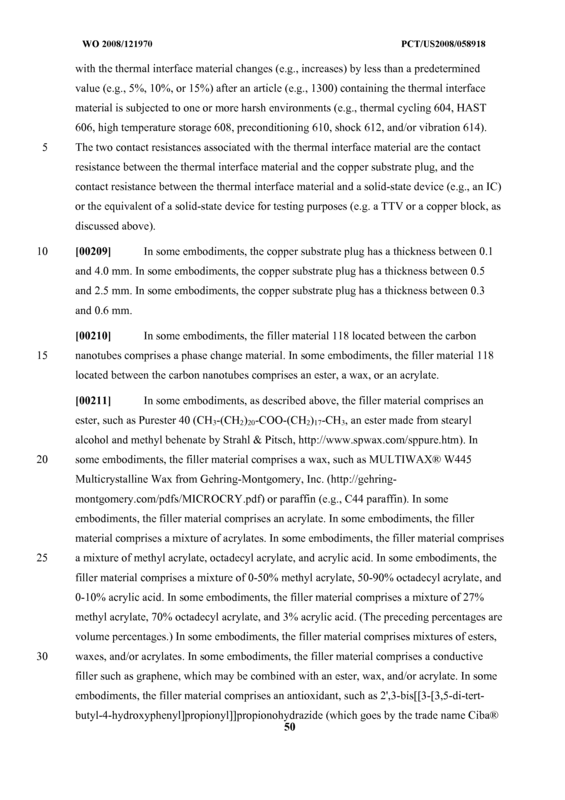 The article of manufacture of claim 2, wherein the filler material located between the carbon nanotubes comprises a mixture of methyl acrylate, octadecyl acrylate, and acrylic acid. 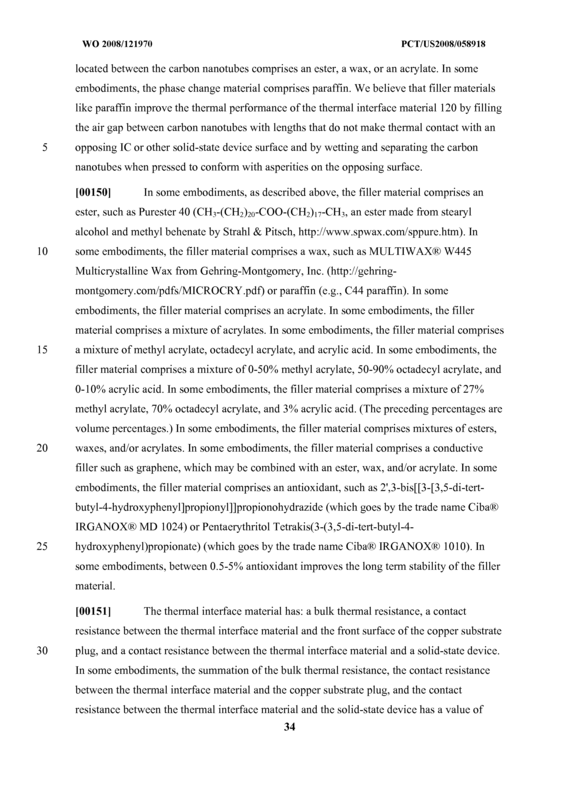 The article of manufacture of claim 2, wherein the filler material located between the carbon nanotubes comprises a mixture of 0-50% methyl acrylate, 50-90% octadecyl acrylate, and 0-10% acrylic acid. 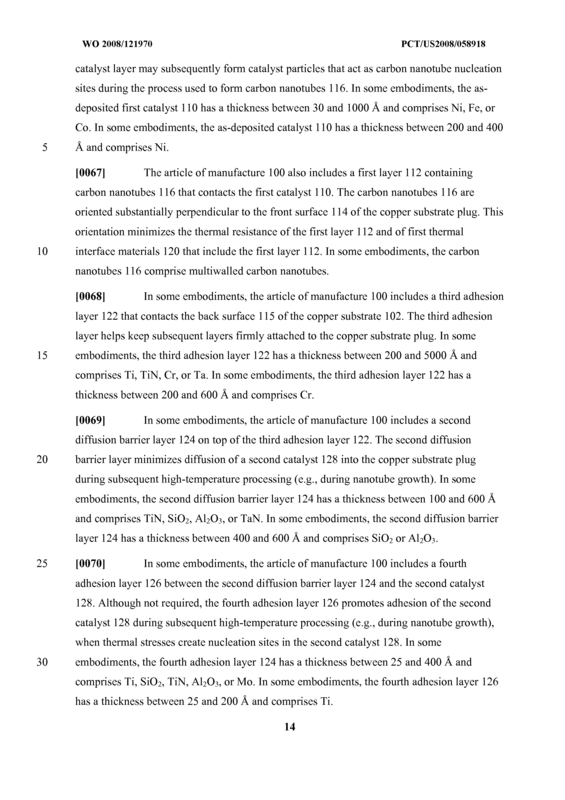 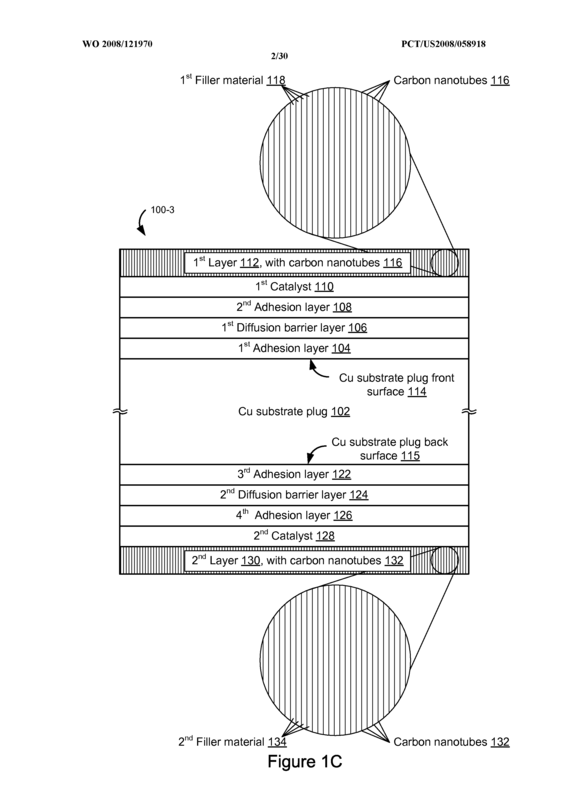 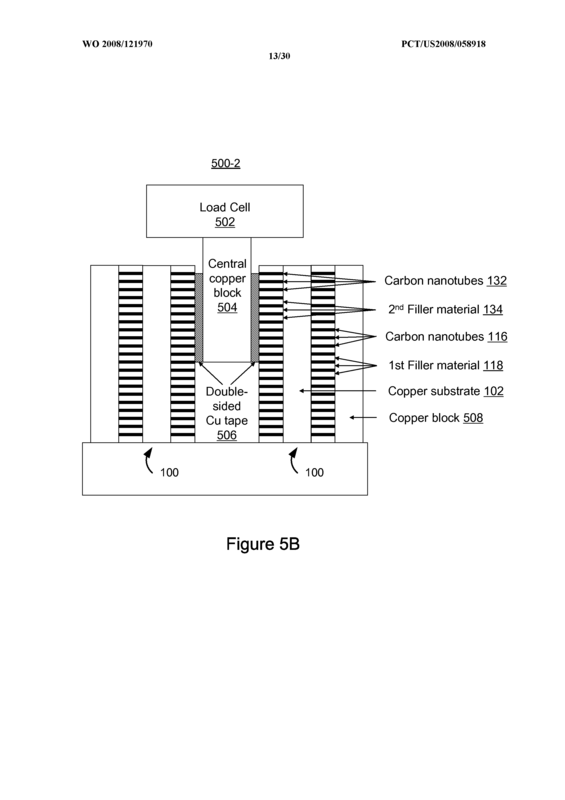 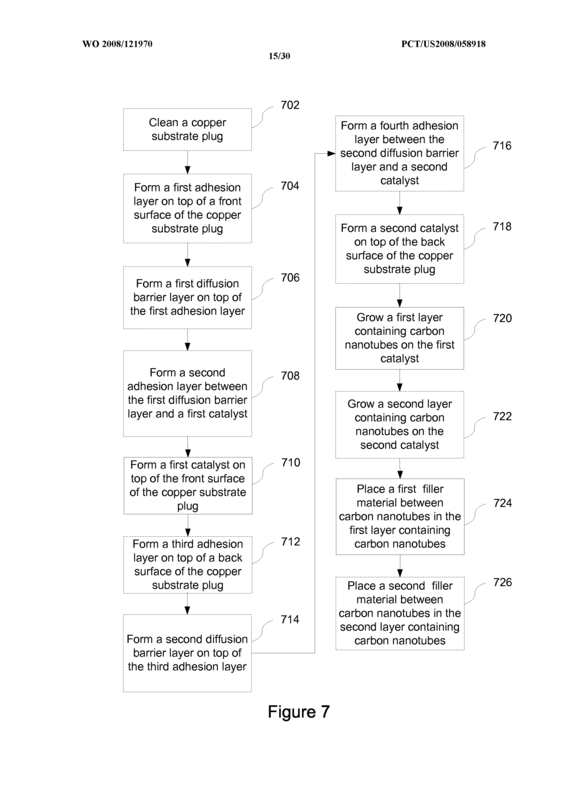 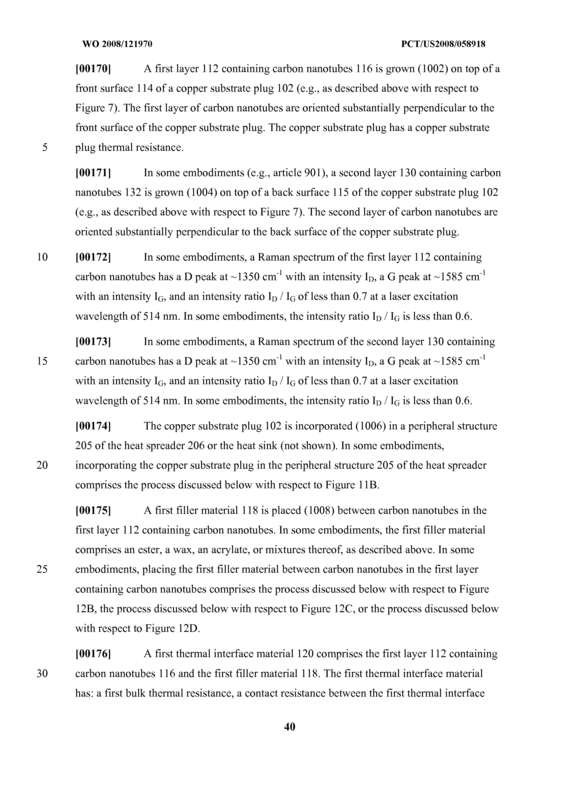 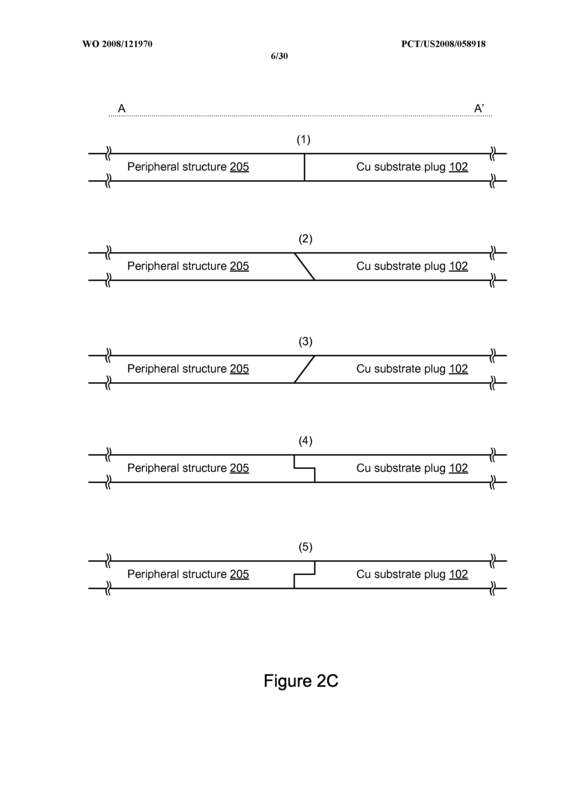 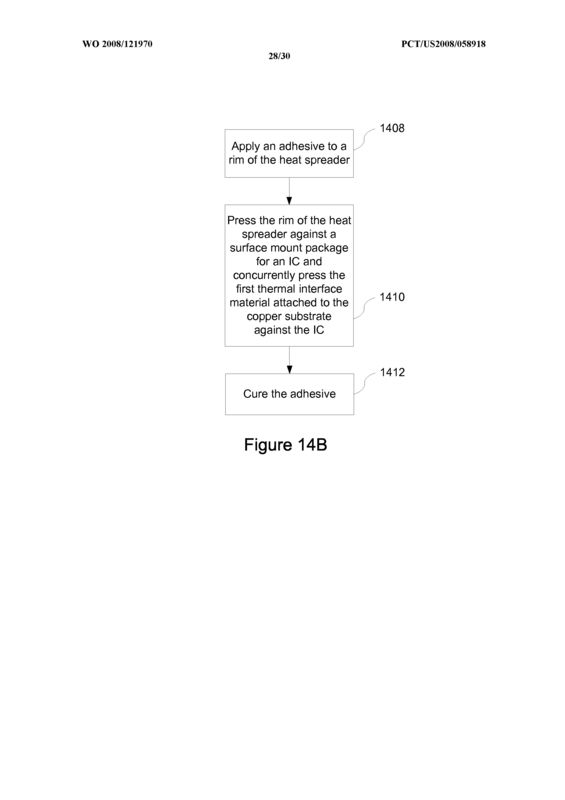 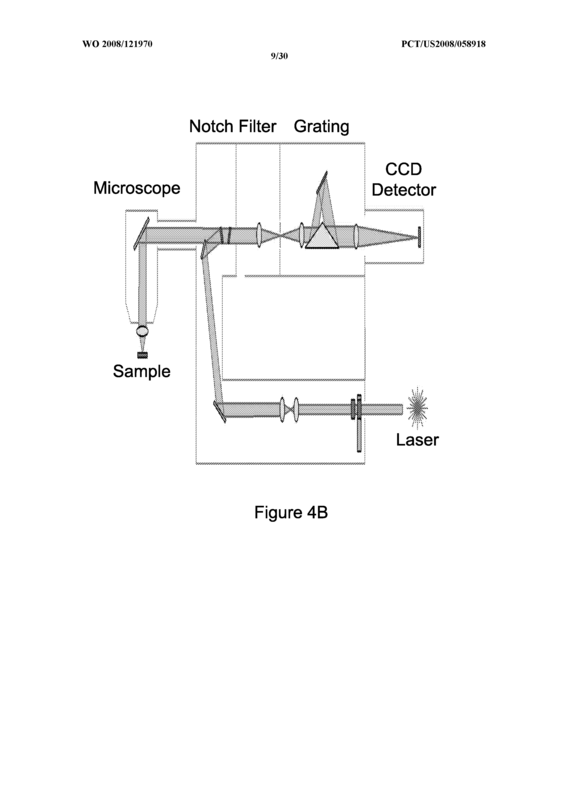 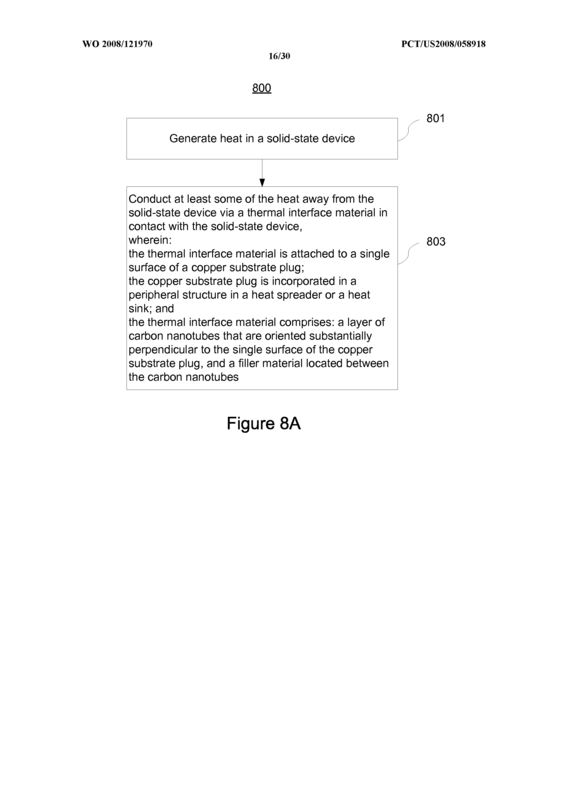 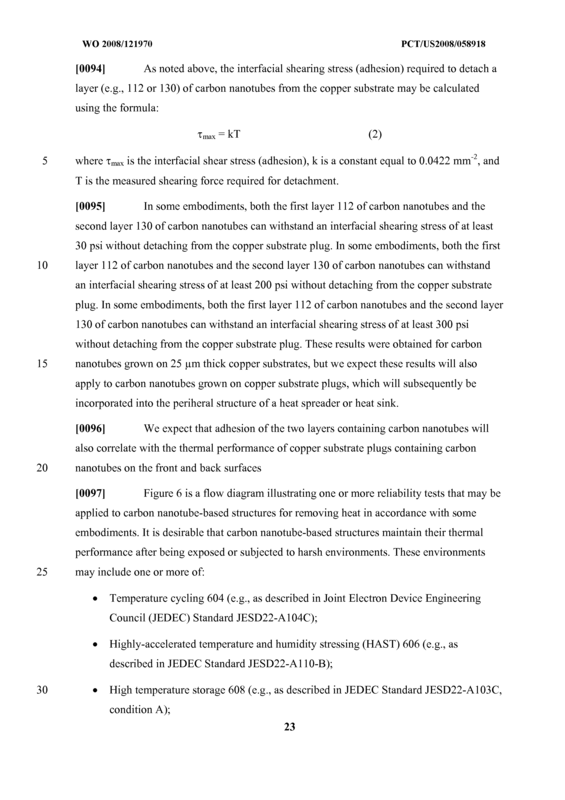 The article of manufacture of claim 2, wherein the layer of carbon nanotubes is attached to the copper substrate plug and can withstand an interfacial shearing stress of at least 300 psi without detaching from the copper substrate plug. 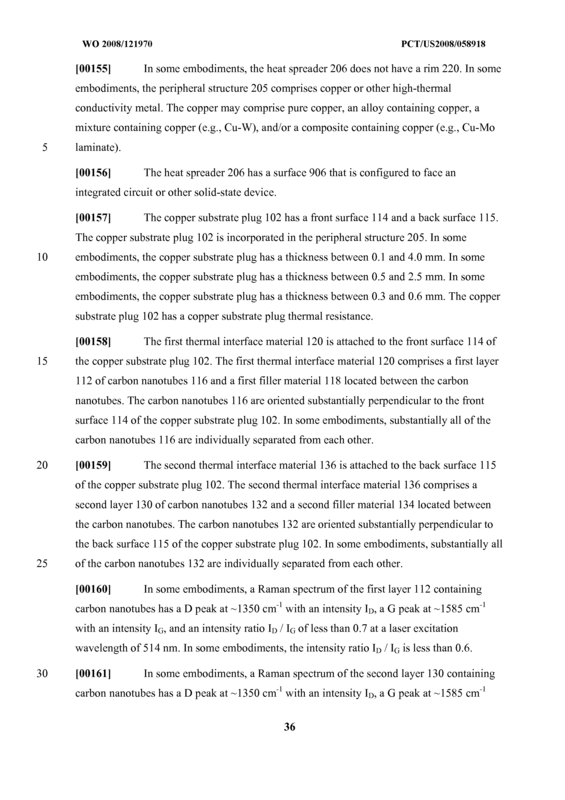 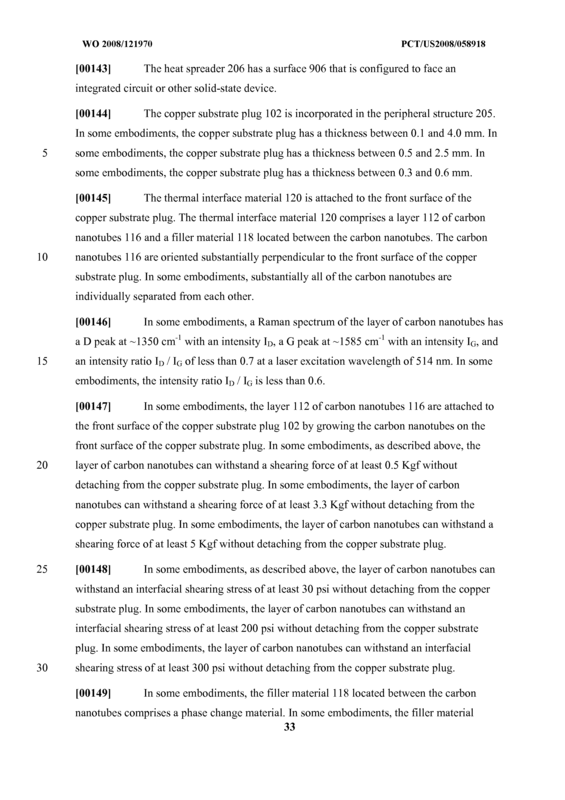 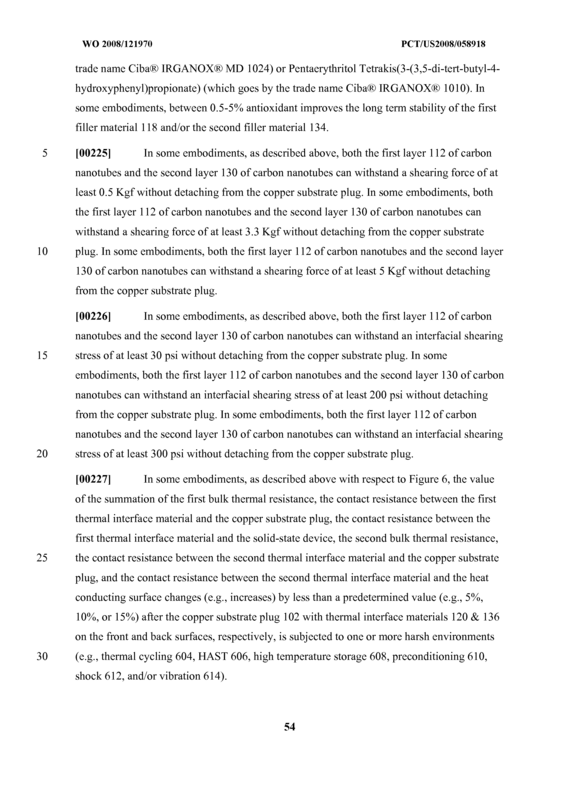 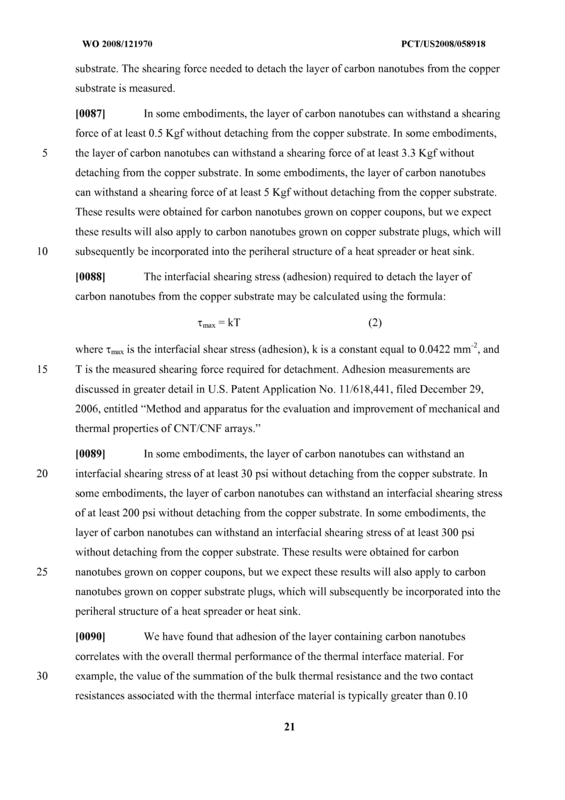 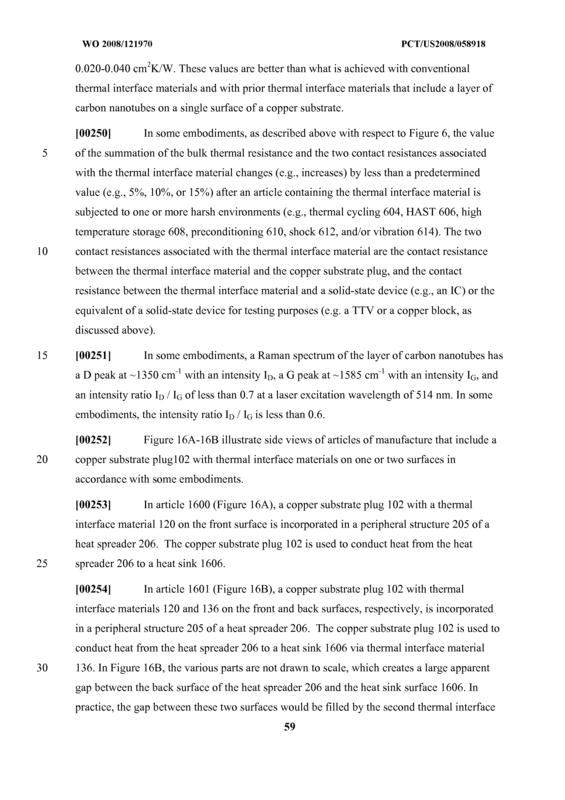 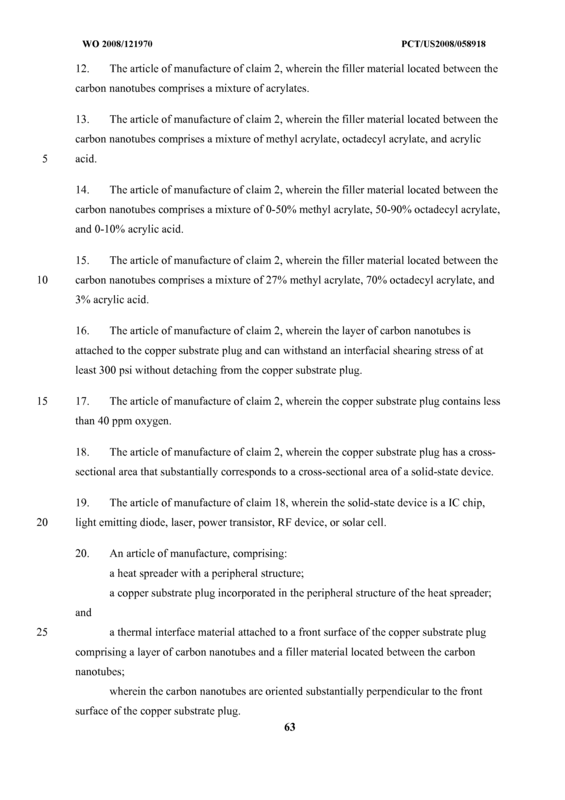 The article of manufacture of claim 2, wherein the copper substrate plug contains less than 40 ppm oxygen. 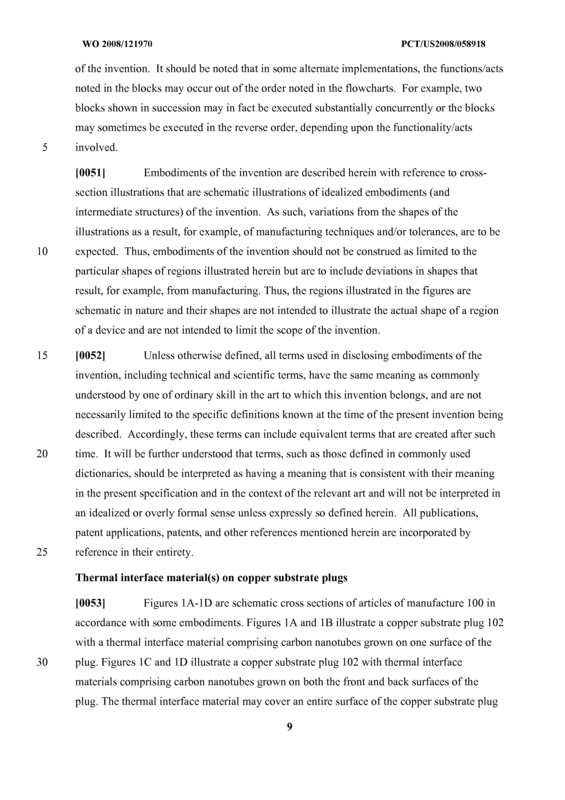 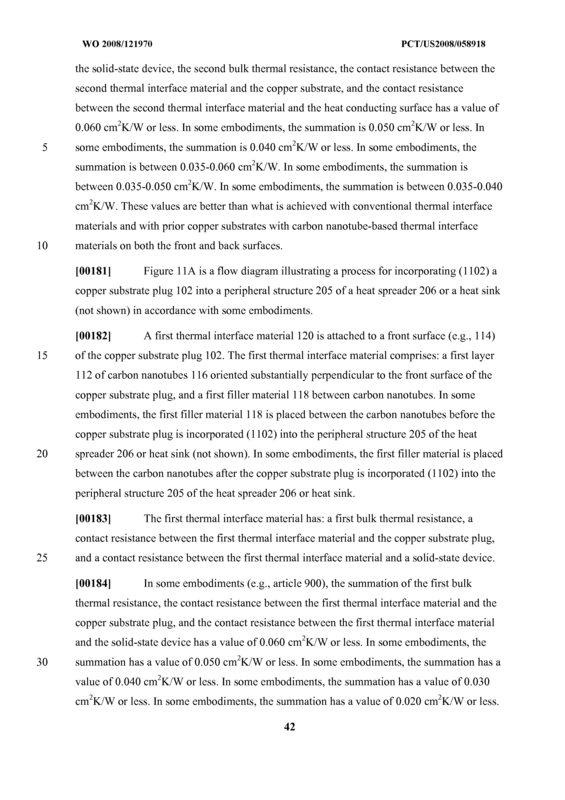 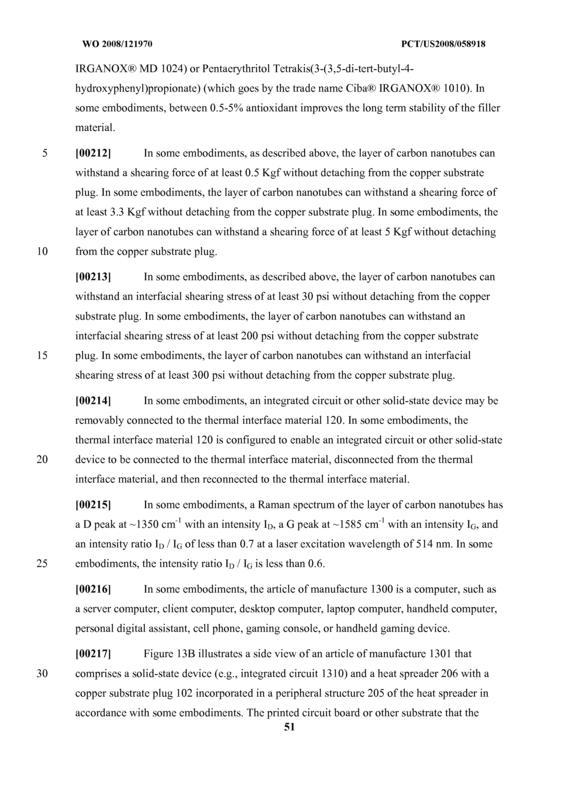 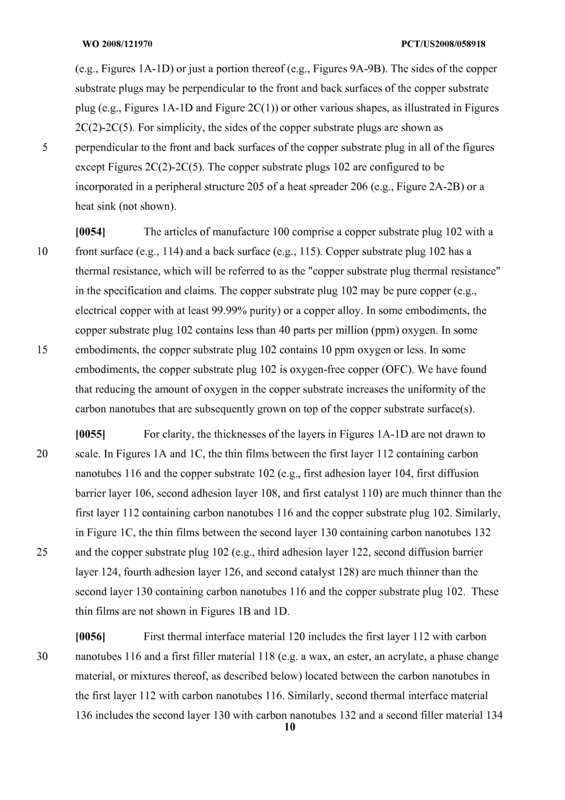 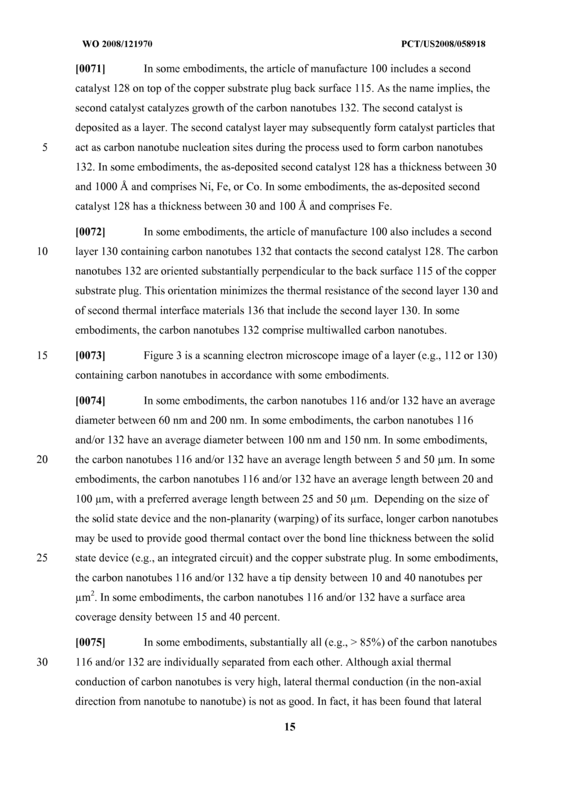 The article of manufacture of claim 2, wherein the copper substrate plug has a cross- sectional area that substantially corresponds to a cross-sectional area of a solid-state device. 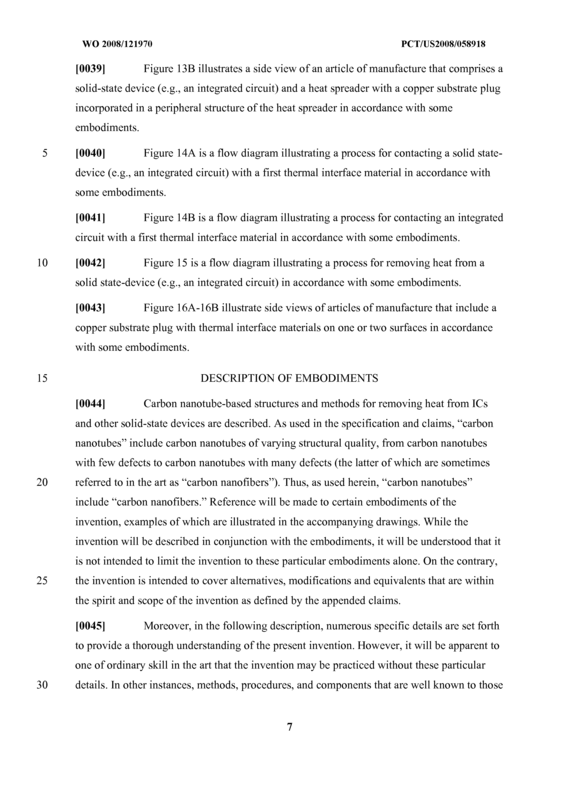 The article of manufacture of claim 18, wherein the solid-state device is a IC chip, light emitting diode, laser, power transistor, RF device, or solar cell. 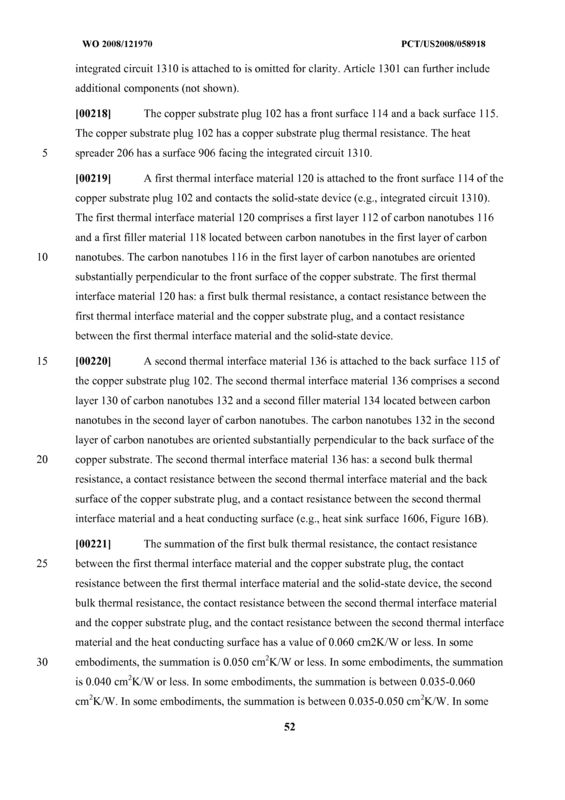 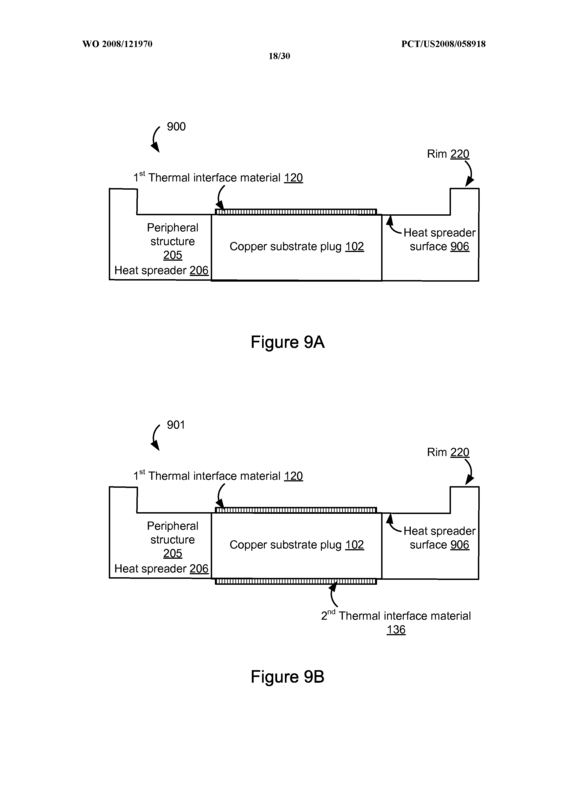 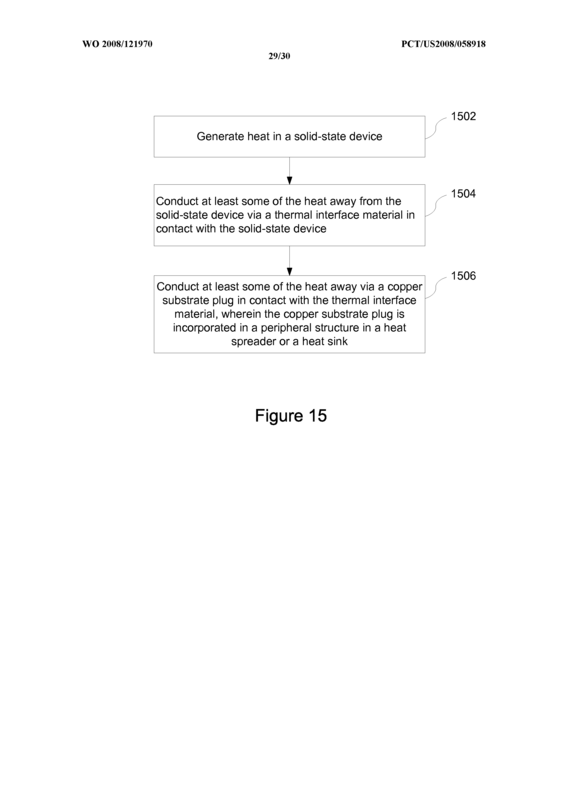 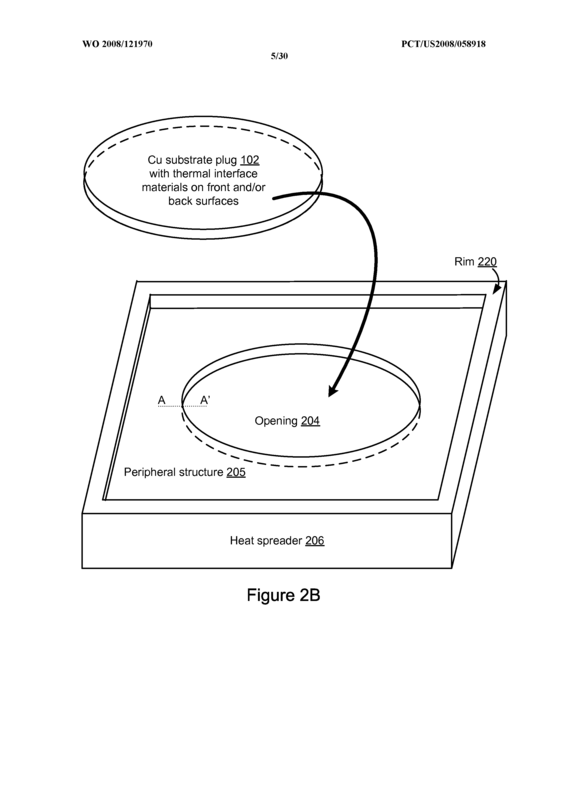 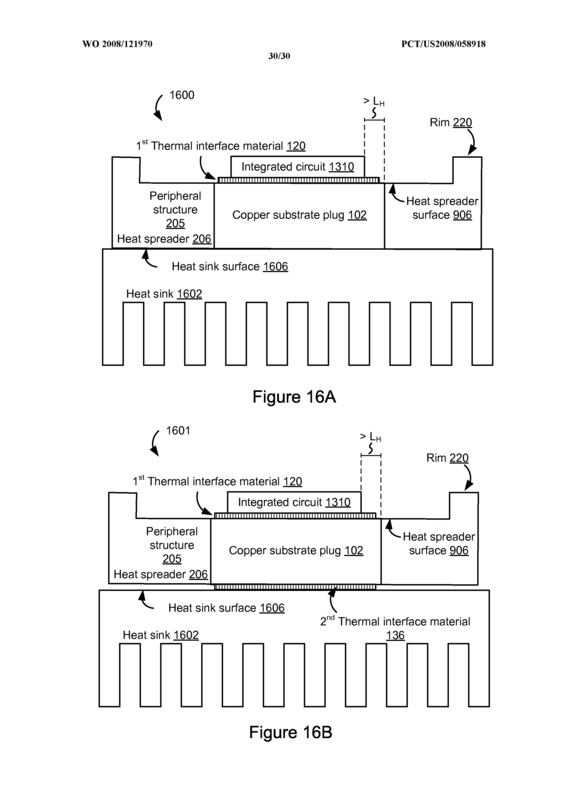 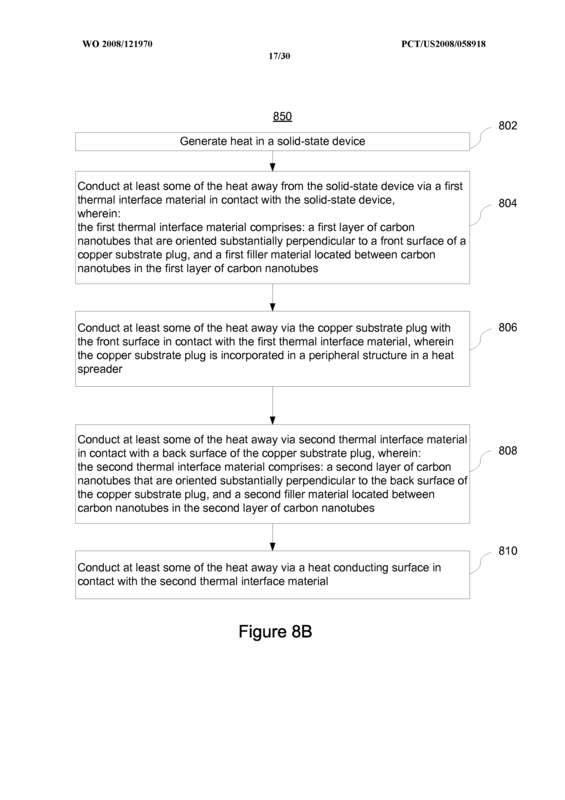 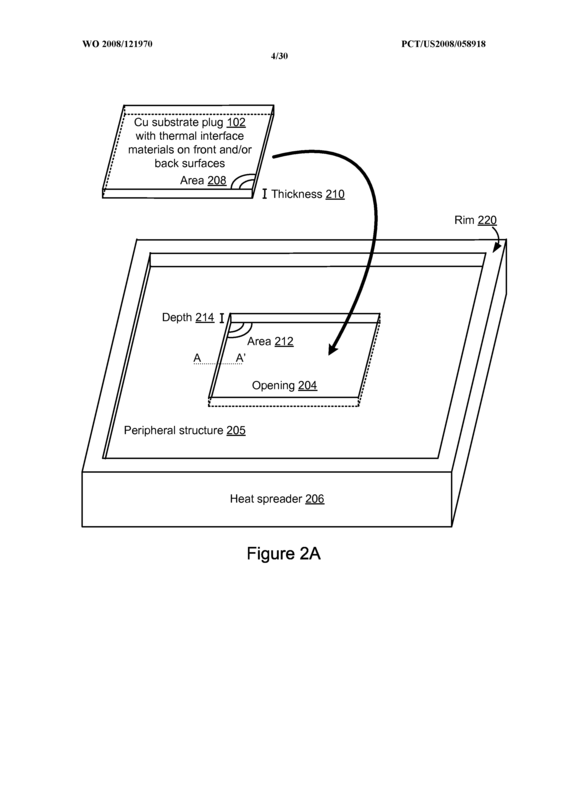 An article of manufacture, comprising: a heat spreader with a peripheral structure; a copper substrate plug incorporated in the peripheral structure of the heat spreader; and a thermal interface material attached to a front surface of the copper substrate plug comprising a layer of carbon nanotubes and a filler material located between the carbon nanotubes; wherein the carbon nanotubes are oriented substantially perpendicular to the front surface of the copper substrate plug.